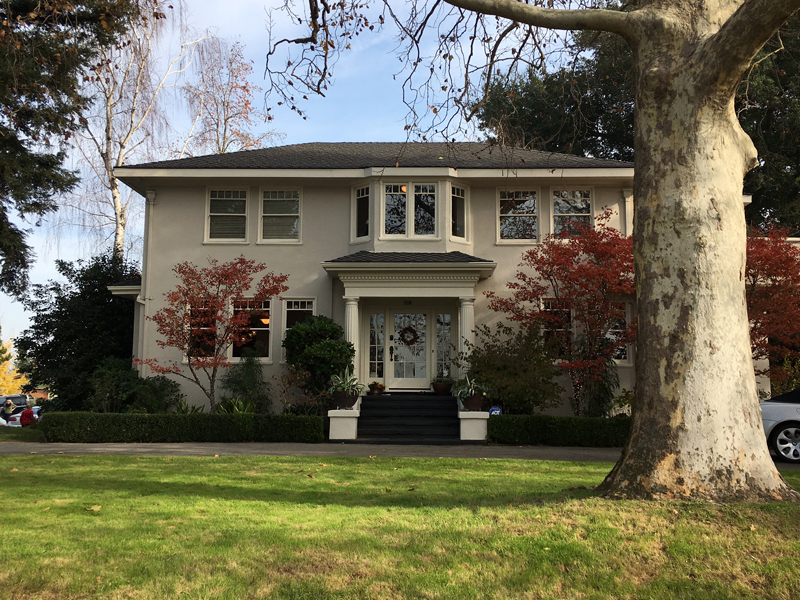 My Mom and I used to go on holiday home tours back when we lived in the San Jose/Willow Glen area of Northern CA and I haven’t been to one since moving to Sacramento 17 years ago. 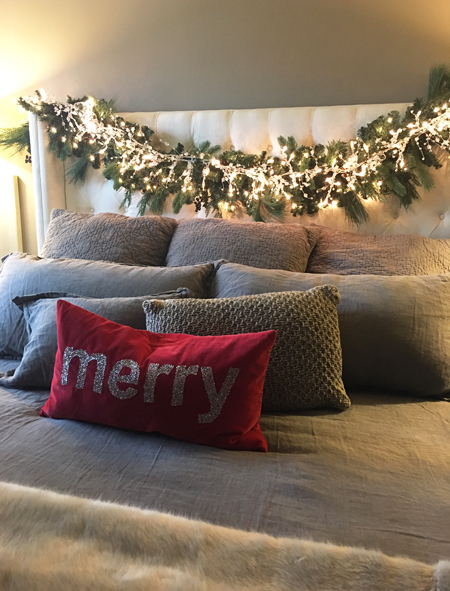 It’s no secret to friends and family and long time blog readers that I’m a little obsessed with decorating my home for Christmas. 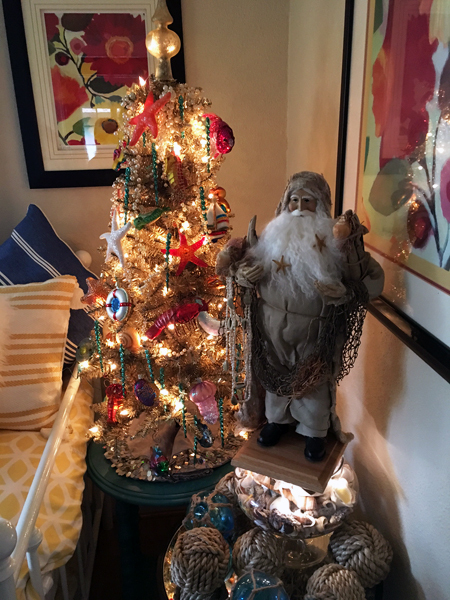 I love everything about the holidays… from family traditions, special ornaments given to me or gathered, favorite decorations, stockings and twinkle lights, to picking out a fresh wreath and tree every year. I have over 25 crates and tubs in the attic full of treasures I’ve found over the years and I still look forward to adding a few new things to my collection every year. 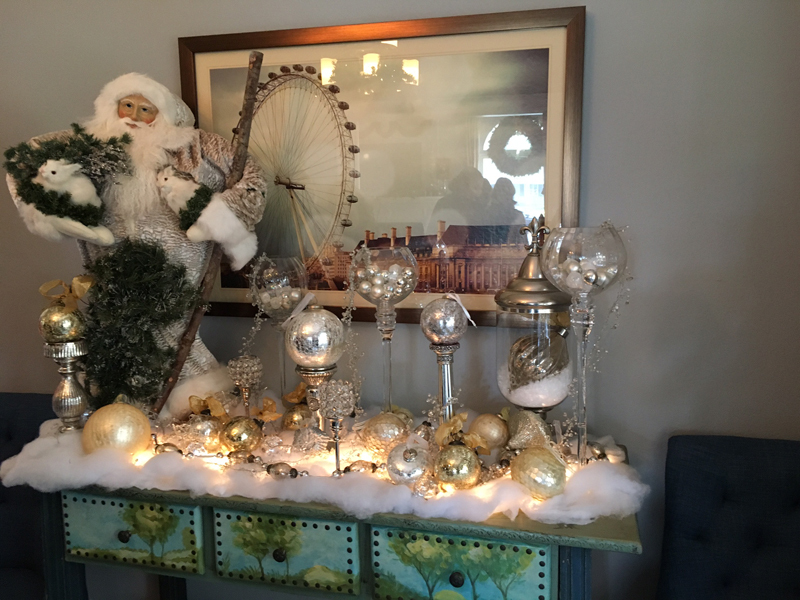 When the opportunity once again came up to see how others decorate their homes for Christmas, it was an easy decision, I forked over my $35 and enjoyed a fantastic day with friends. 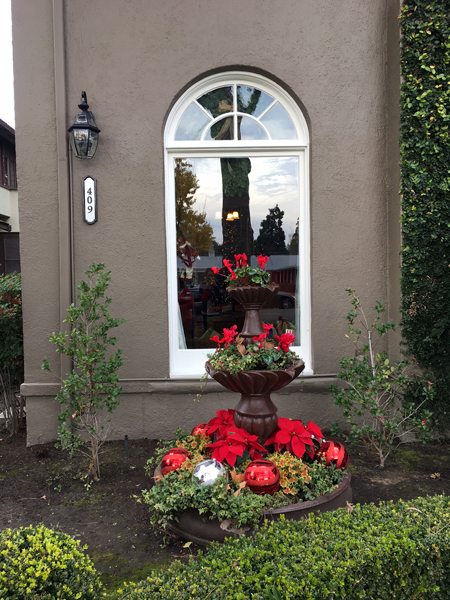 All proceeds from the Omega Nu Holiday Home Tour benefit Lodi, CA area charities chosen by the individual home owners and Omega Nu members. 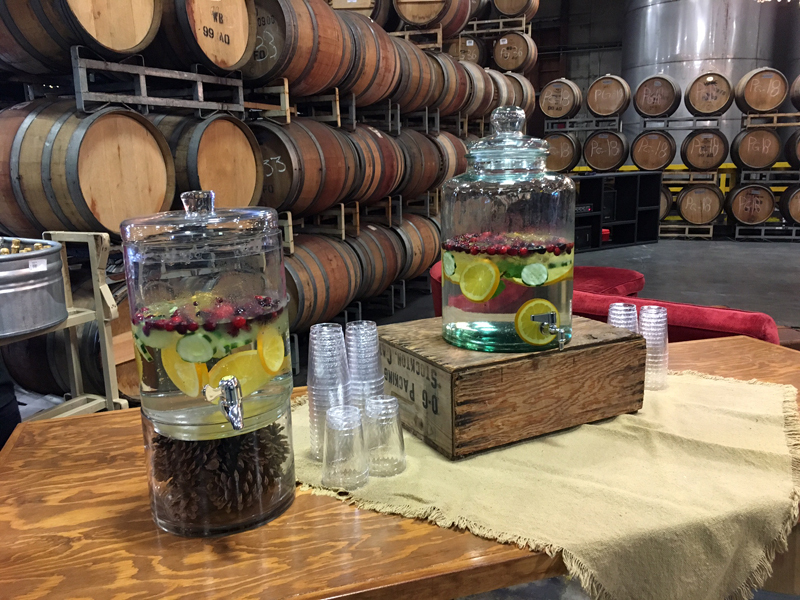 We checked into one of the warehouses at Weibel Family Vineyards & Winery for our wristbands and complimentary wine tasting, coffee, tea and tasty treats. 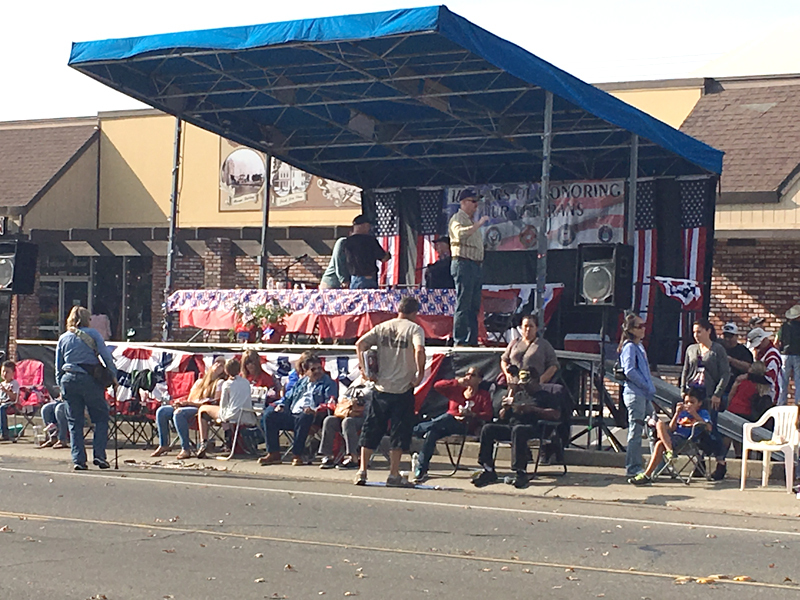 They also had local vendors for shopping opportunities. 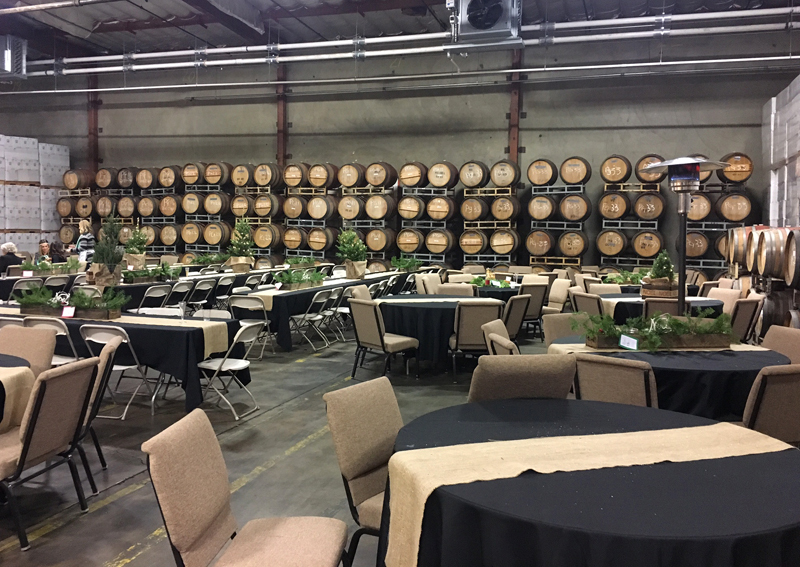 There was an option to purchase tickets that included brunch, but we opted for the cheaper tickets that included wine tasting and treats. 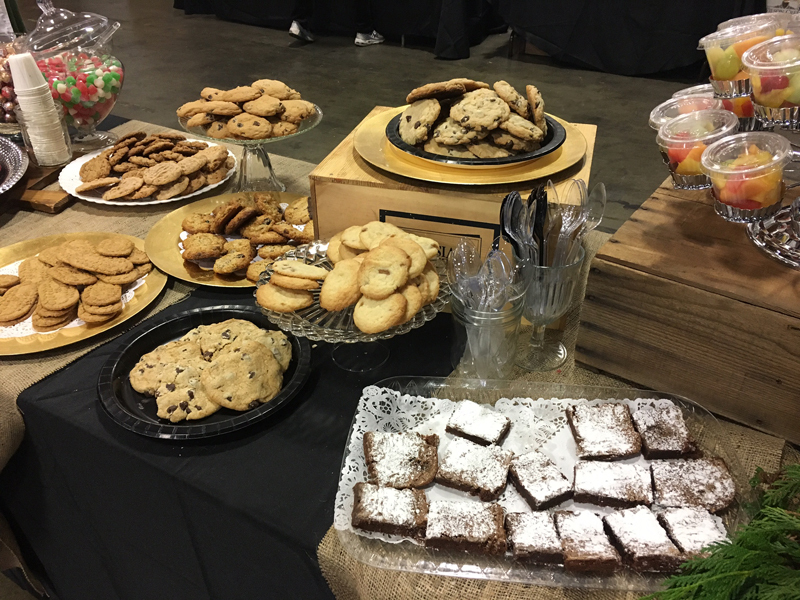 The treat buffet table set-up was adorable and very inviting. It’s so nice when people/caterers take the extra effort with the tablescape, plus I always end up with some take-away ideas. Lots of baked goods, candy and fruit to choose from. Flavored water, yes please. While I wouldn’t normally combine lemon, cucumber and cranberries in the same container, it was refreshing. I also liked the added pine cones in the bottom of the first dispenser – makes me want to get one that has that empty space at the bottom to add party themed items. I usually do what they did with the second one, place it on a crate or wooden box. 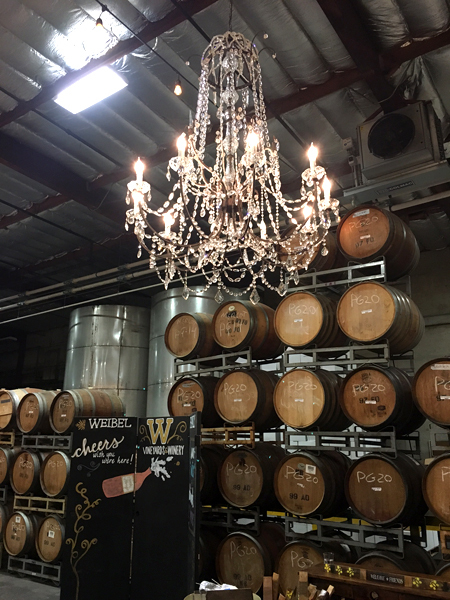 I dig how chandeliers fancy up any environment, especially outdoors or in more industrial spaces. This particular one hung near the photo op/prop area. 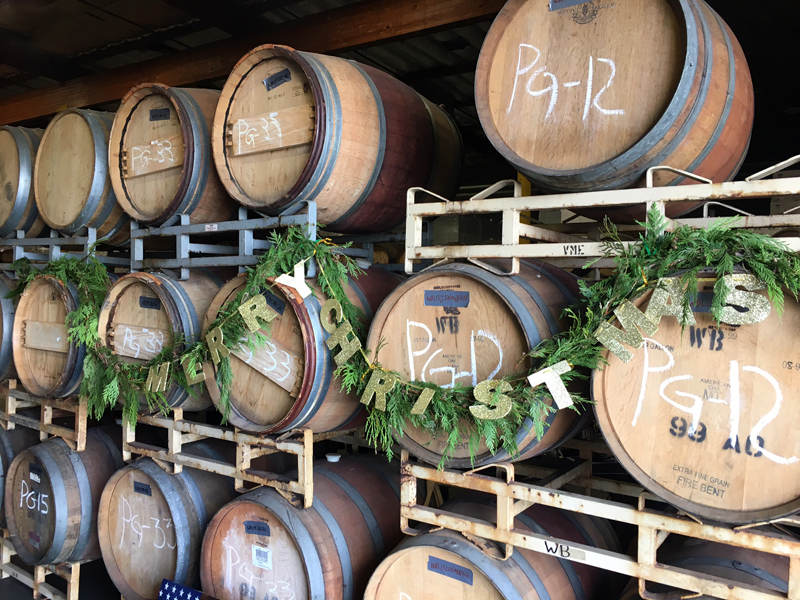 The background for photos was made out of three old doors hinged together and painted with chalk paint – we all took note and thought that was cool. We started the house tour at Mills Mansion, built in the early 1920’s. 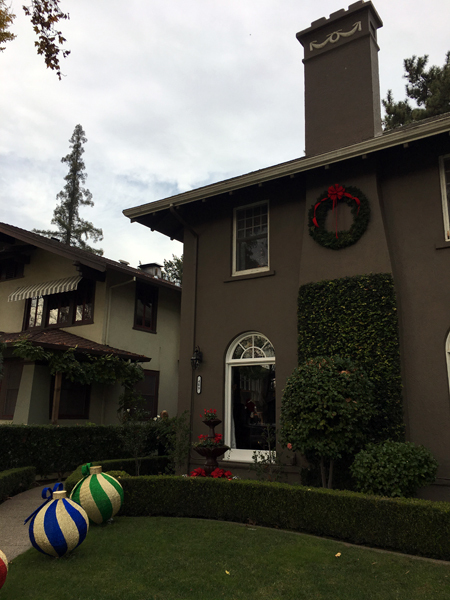 The house was gorgeous, but it wasn’t really decorated for the holidays. There was a tree and a few wreaths, so our hope was that the others had more. Also the reason why I didn’t include any interior photos. The Sideways House, named for its entrance located on the side of the home was up next. I could tell by the outside that the house would be filled with holiday decor and I was right. The front room was gorgeous, it didn’t photograph well, but think Pottery Barn meets Restoration Hardware with a bunch of vintage and re-purposed finds thrown in, definitely my style. The house had 10 Christmas trees, all themed differently. This made me want to put plants in my backyard fountain. One of the bedrooms had beach themed ornaments. Every room in the house had a small tree and it made me miss having multiple trees in my own house. 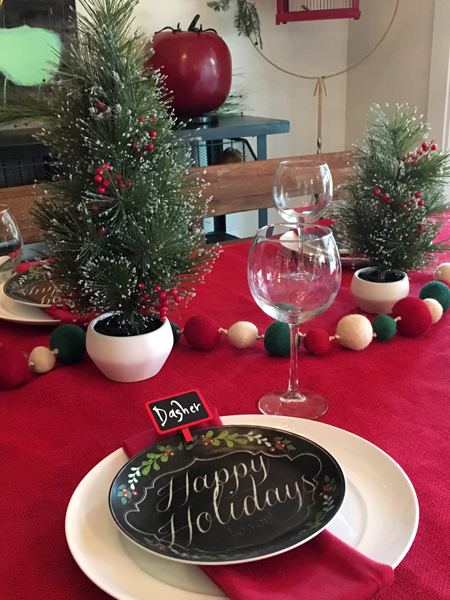 It was in this house that I decided I would take photos of the dining room place settings to keep with the food theme of this blog. There was so much whimsy in this dinette area off the kitchen.The formal dining room had cool birch trees with ornaments and lanterns with flame-less candles. The dining room side buffet cabinet was decked out too. I loved the ferris wheel print. Definitely a more formal place setting compared to the kitchenette table. My family has done traditional English Crackers for Christmas… all sitting around in our paper crowns playing with our puzzles and other trinkets. One of the cool things about the Sideway House is that it’s available to rent through vrbo.com (#910351) or airbnb.com (#15536196) – now that’s great marketing right there. 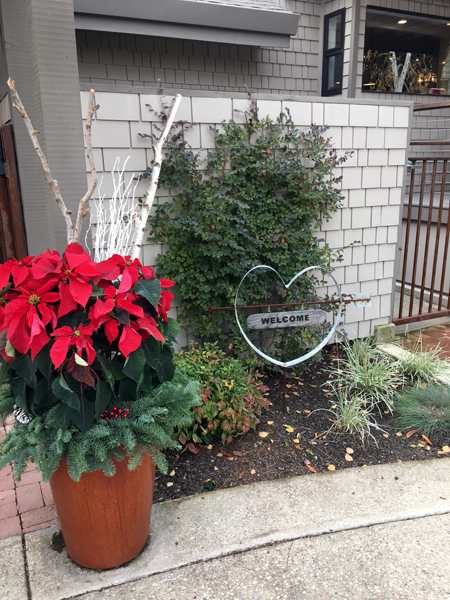 A holiday home tour of your gorgeous rental property, love that! It runs about $300 a night and can accommodate sleeping for 8. I’m seeing a girl’s weekend of wine tasting in my near future. Next up was the Hill House Mansion. Built at the turn of the century, Hill House was the home of George Washington Hill, his wife Mary Hill and their children, Nellie and Maurice. 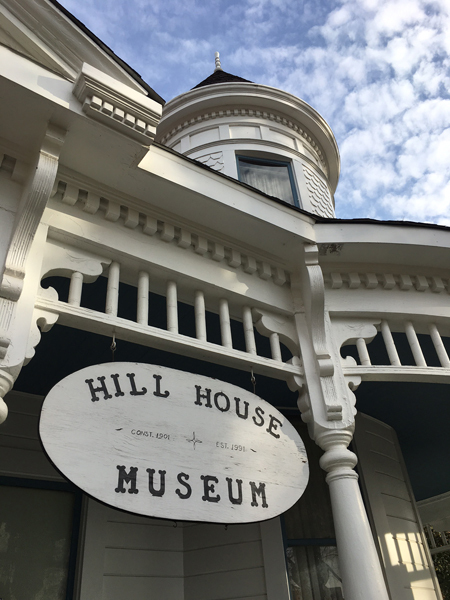 When Maurice died in 1984, he left the HIll House and its contents in a trust to the people of Lodi, CA with the stipulation that it be turned into a museum. 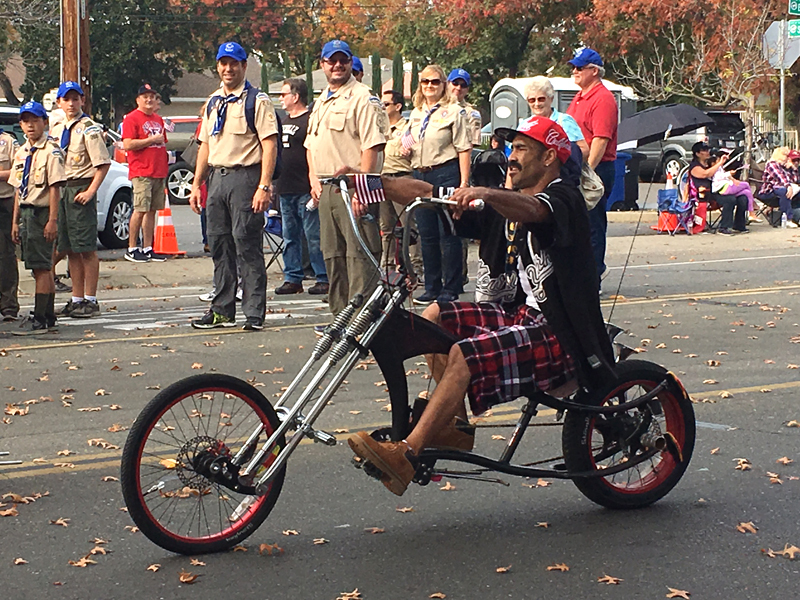 Hey…I know those two ladies waving, LOL. The Hill House decor reminded me of The National Hotel in Nevada City. 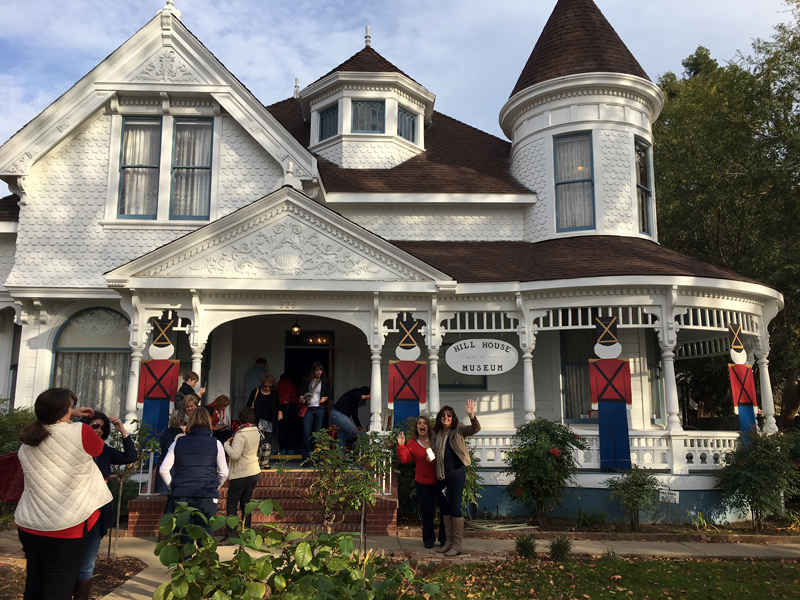 My sister in law is from Nevada City and she introduced me to their Victorian Christmas celebration and it truly is magical, I love it! One of the museum volunteers at Hill House heard me talk about the similarity to the hotel and she chimed in that they were from the same era and she could see how I would think that. 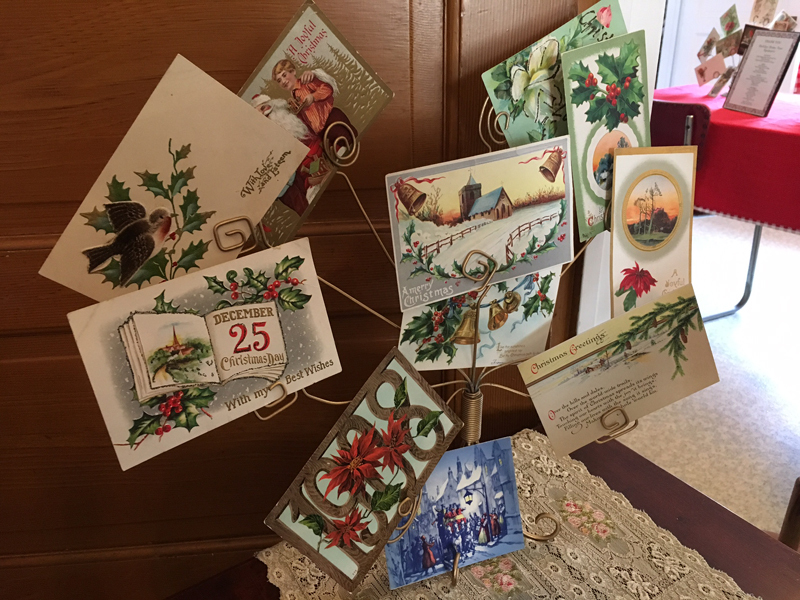 These vintage holiday cards and post cards reminded me of the ones I’ve picked up at various antique shops or shows. I also have a few from my grandparent’s collection. 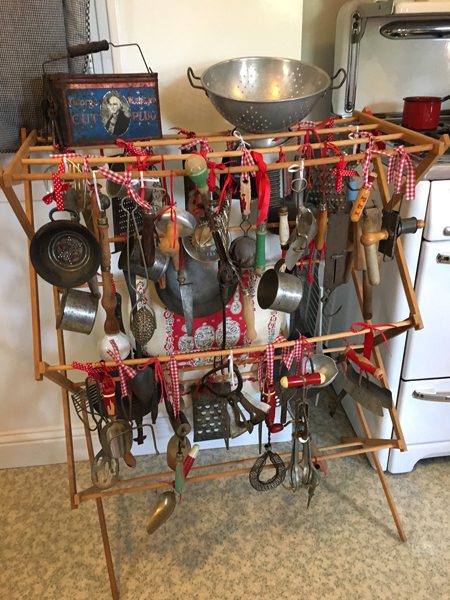 The kitchen utensils reminded me of my Mom’s collection. Such a fun way to display them in the museum. 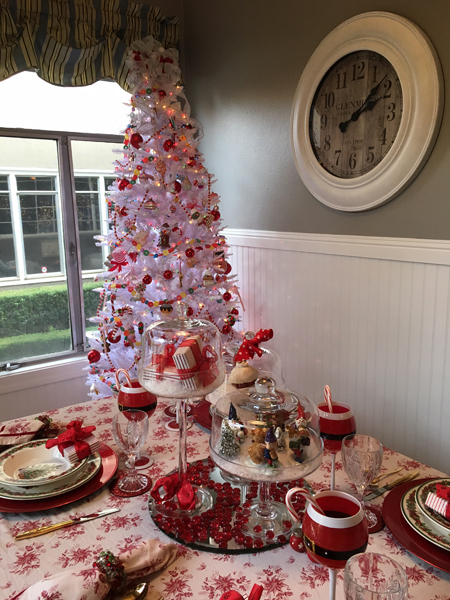 Each room also had a Christmas tree filled with vintage themed ornaments. I’m not a “doll” person at all – too many horror movies, so I opted to pass on photos of the rooms since there were porcelain dolls everywhere. 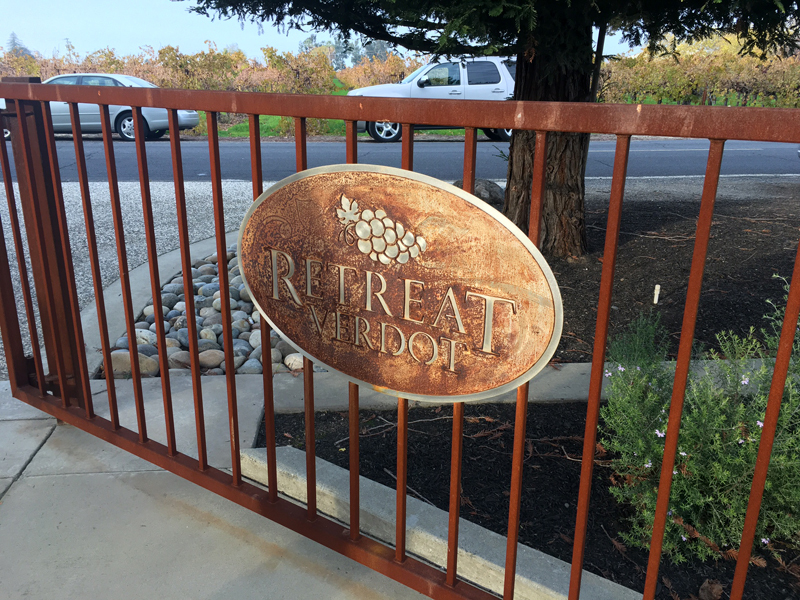 Retreat Verdot was next on our list. 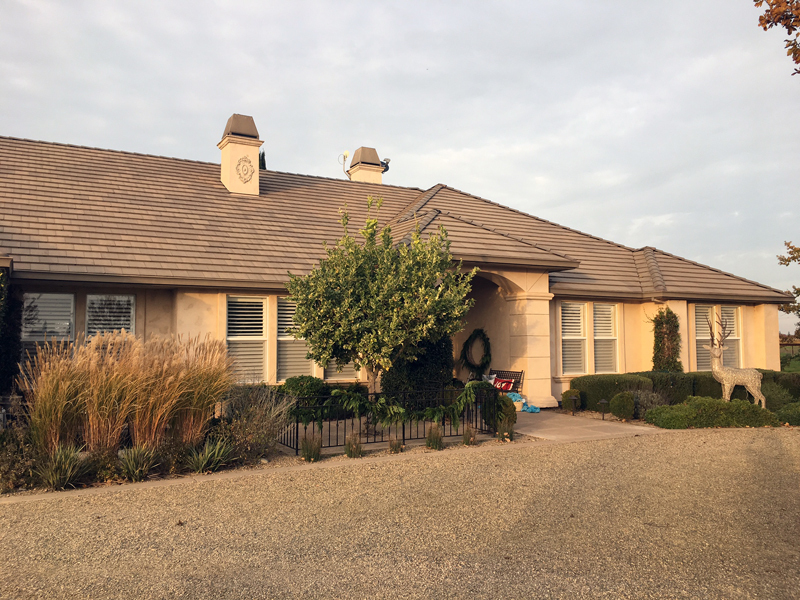 The house was set in the middle of a Petite Verdot vineyard and is owned by a couple that spends half of the year there and the other half in Florida. The original farmhouse and workshop garage have been fully renovated and it was my favorite house of the tour. 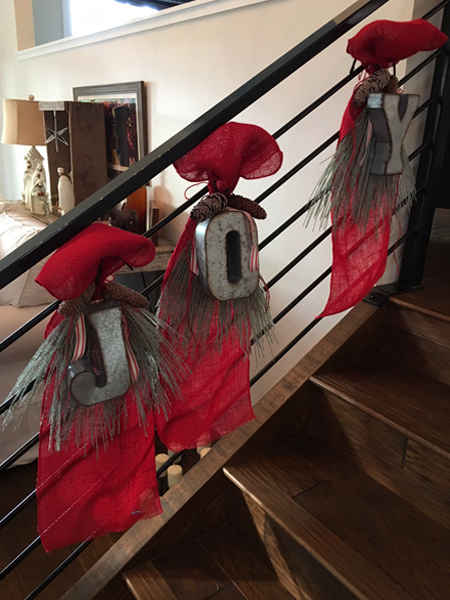 The decorator, mild OCD/perfectionist in me wanted to fix the spacing between the “o” and the “y” and since I didn’t, you all get to suffer with this photo too. I’m sure someone just bumped it on their way up the stairs. 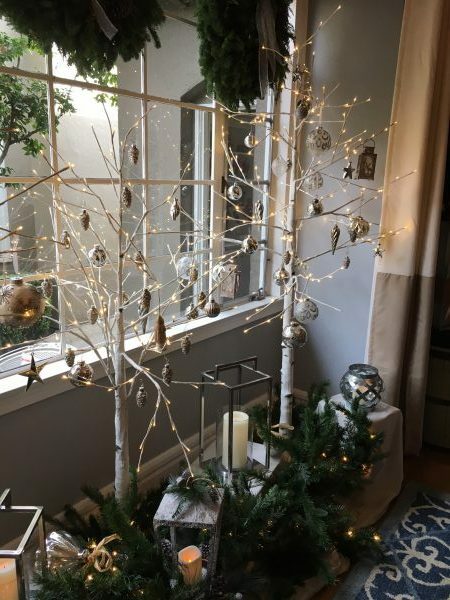 I loved the simplicity of the front room decor, they had a beautiful tree next to a big, white brick fireplace. A second more casual sitting/TV area was just up the stairs to the left with the kitchen directly across from that. 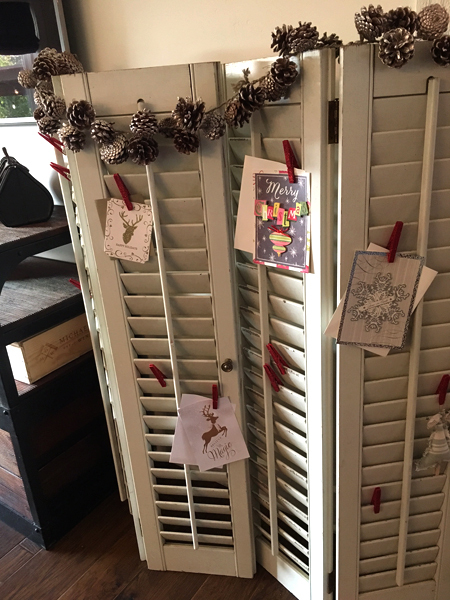 I thought the shutters were a fun way to display Christmas cards… I’d seen it on Pinterest, but seeing it in person made me want to find some old shutters for next year. 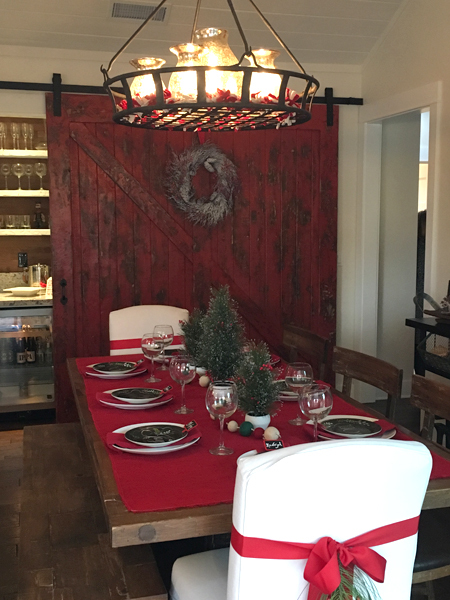 The coolest part of the upstairs dining area was the red bar door. 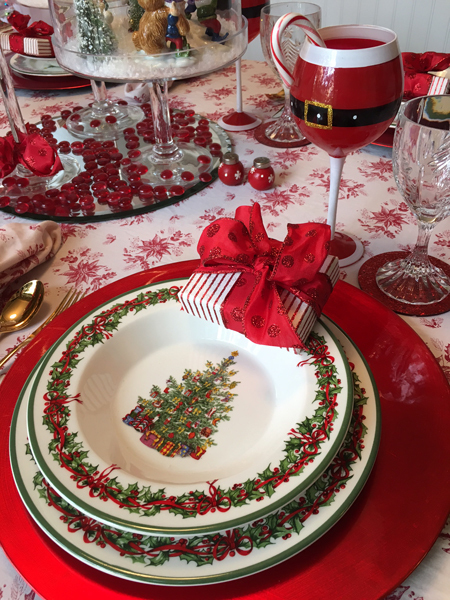 Red is too bold for me color wise for long term use, but dang it sure looked good in that house and especially during this time of year – the pop of red really added to the overall muted decor of the home and was the perfect backdrop to the dining room table. 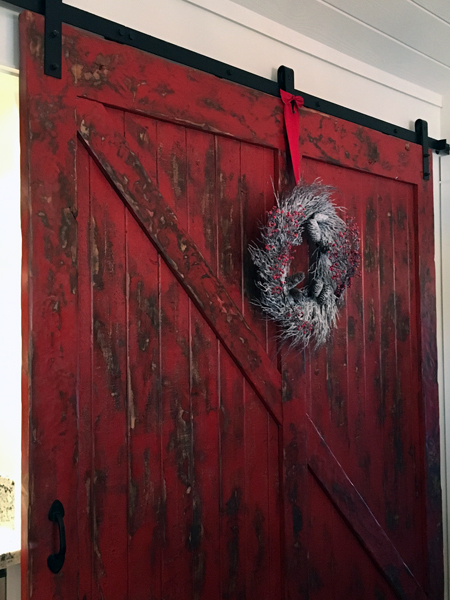 My next house will have a barn door! 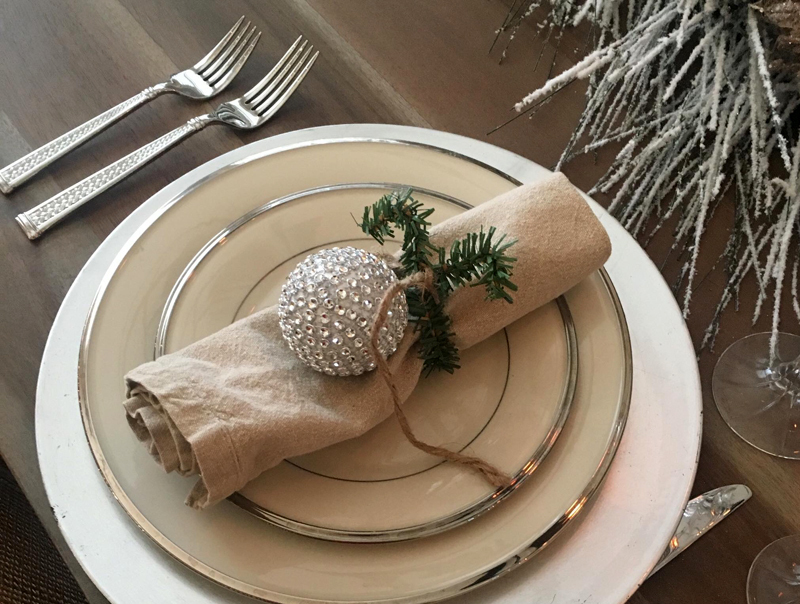 From the reindeer place cards to the felt ball garland – this table was my style for sure. Sub out fresh trees for the fake ones and yes, yes, yes. Retreat Verdot also had a guest house… I was ready to move right in. 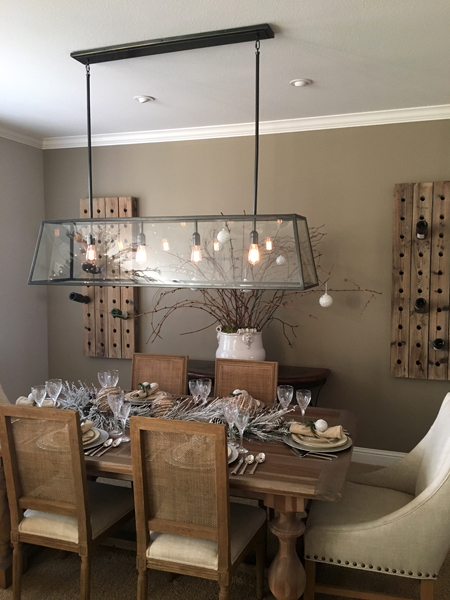 The furniture was my jam and I found the lighting fixture I want to buy for over our dining room table. The best part about this place… it too is listed with vrbo.com (#620830). 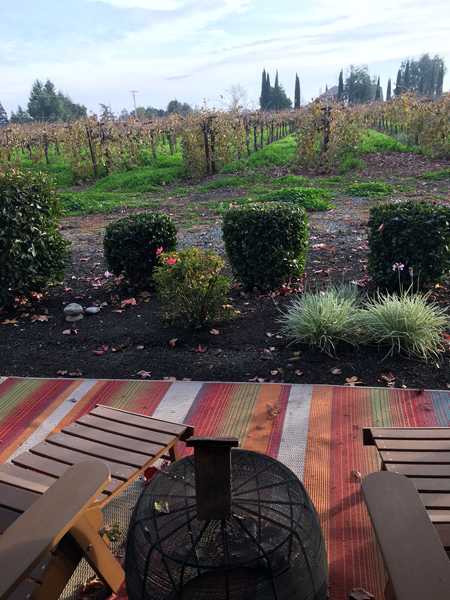 At $443/night with a 3 night minimum stay, it was pricier than the Sideways House, but the property was beautiful and had a pool, spa, tennis courts, bocce ball area, fire pit and the guest house. Definitely more remote than the Sideways House which was walking distance from the downtown area. 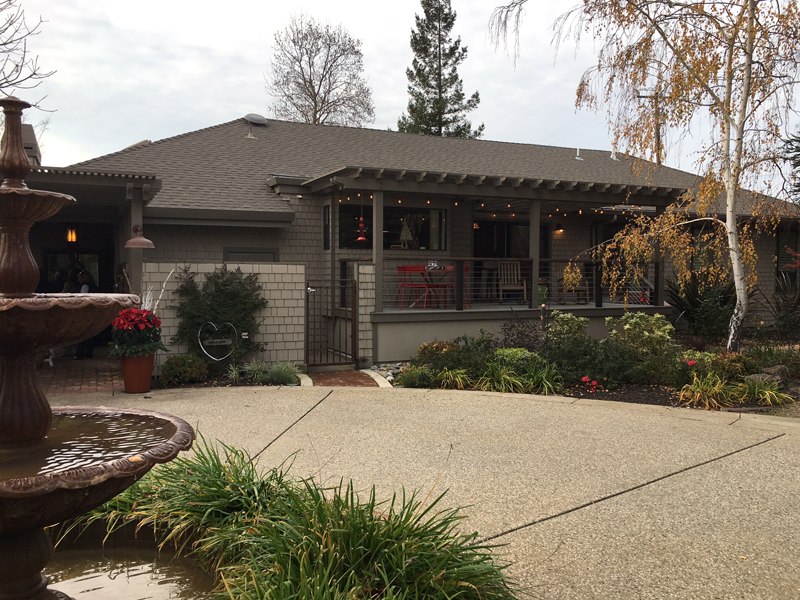 There are lots of photos of the house on vrbo for you to check out. See… their marketing worked. 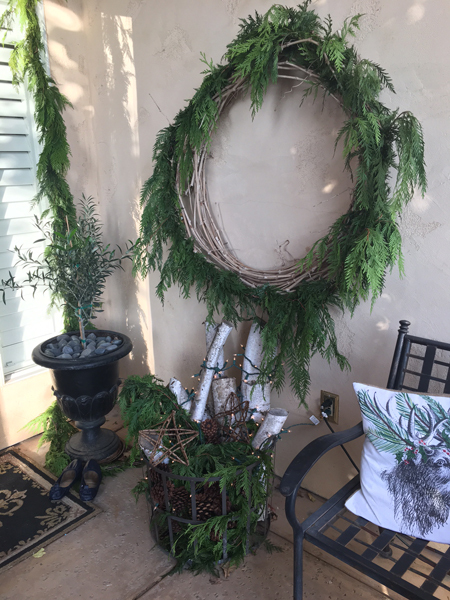 They put their vacation rental on the holiday home tour and here I am blogging about their awesome property and I get nothing in return… except sadness that my house isn’t bigger with more rooms to decorate or that I’m not staying there anytime soon. Ha-ha. Last on our stop was the Modern Farmhouse which also did not disappoint. 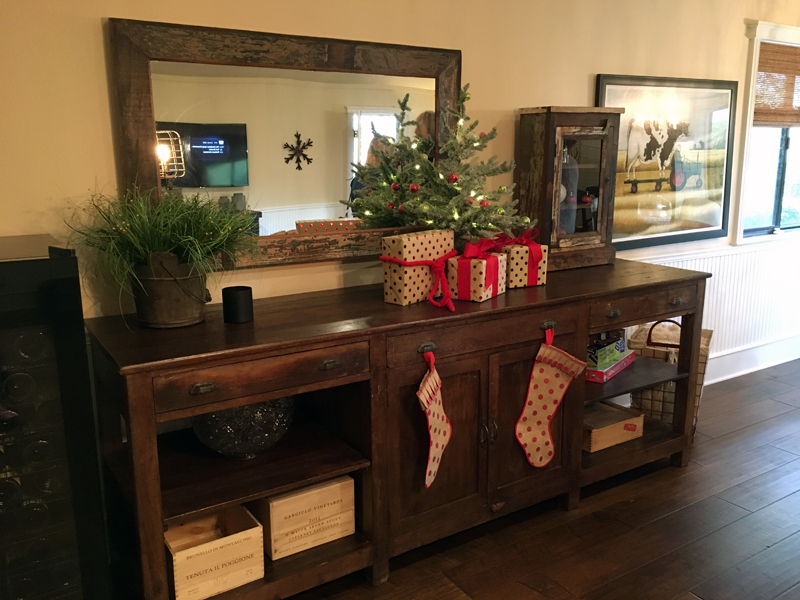 The house was built in 1999 and the style of the home was “modern farmhouse” – the attention to detail with the holiday decor was something I could really relate to. I loved the little touches throughout the house. The fresh greenery on the porch was really nice. 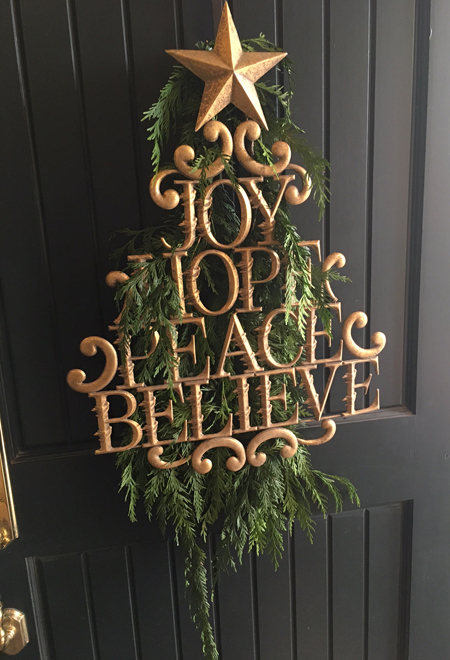 I usually think wreath over swag for my own front door, but this caught my eye. 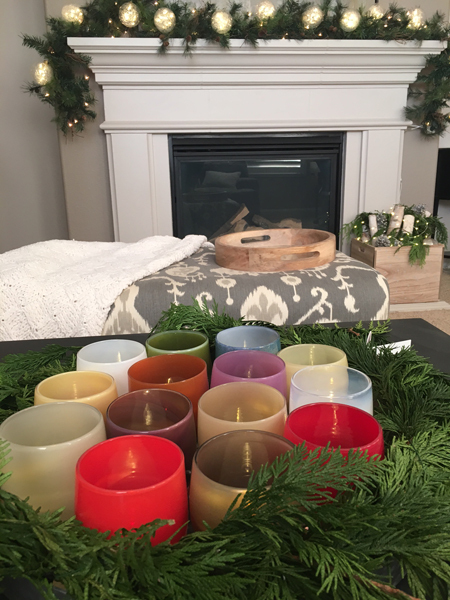 The owner collects glassybaby votives – had no clue what those were until we looked them up. 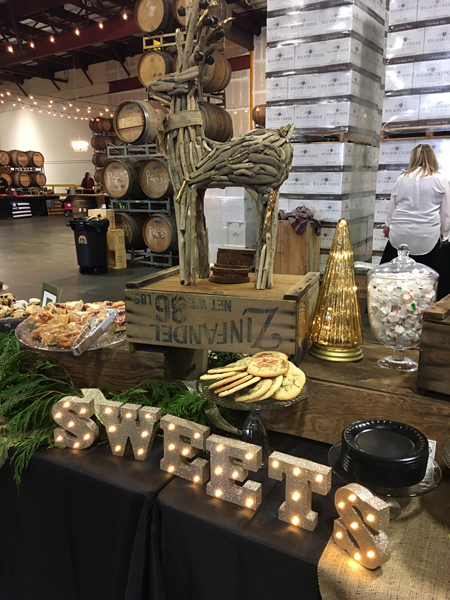 I liked the winter wonderland white mixed throughout the natural and wood decor. 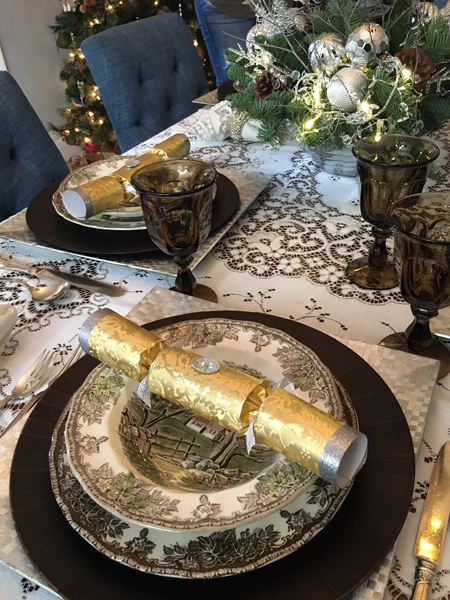 I have very similar china inherited from my grandmother – I liked the linen napkin, but would use fresh greenery. Both kids rooms were decked out. I did love that each bed had a garland. My favorite room of the house was the master bedroom because of that. Makes me want to put a garland on my own headboard. I’m sure the dogs would go to town on that. Okay, maybe not. The room also had a fresh tree in a huge basket opposite the bed. 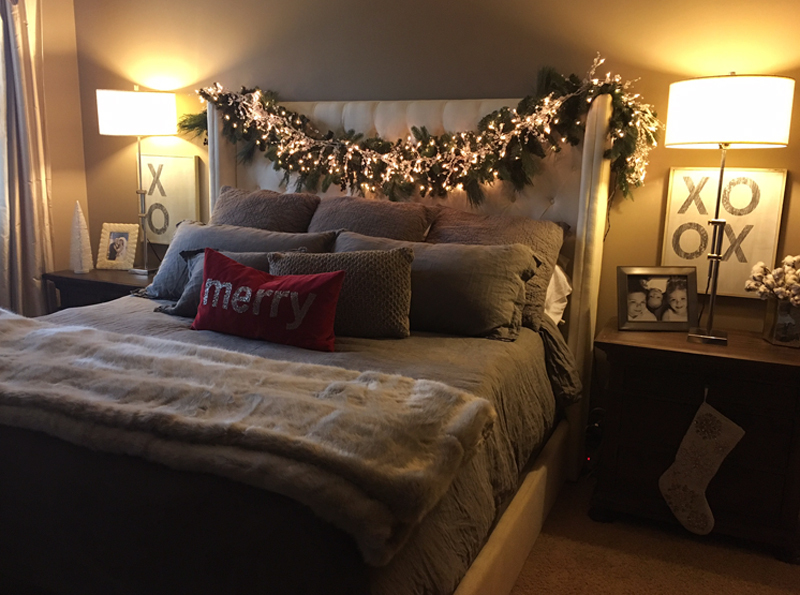 I wanted to jump in and snuggle up with a good book or watch one of my Hallmark Christmas movies. Speaking of, that sounds like a good idea on this Saturday afternoon. Thanks Wendy, Kristen and Jen for letting me tag along on your adventure. 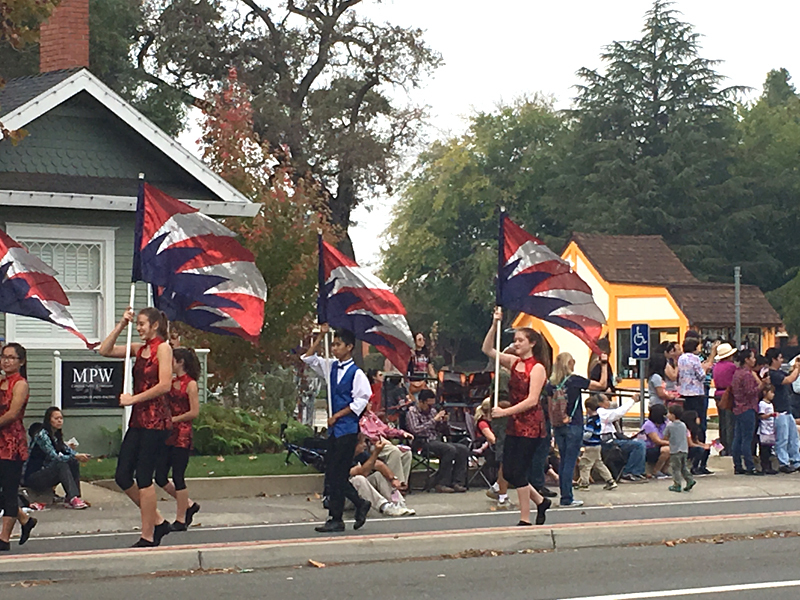 I’m already looking forward to next year and more time together exploring Lodi. 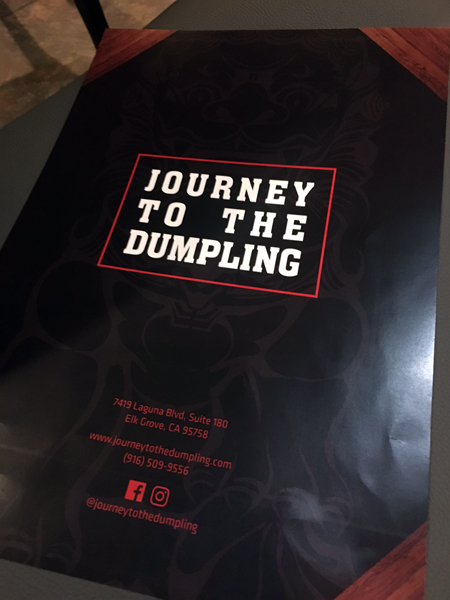 Friends invited us to meet them to try out Journey to the Dumpling, a new-ish restaurant in Elk Grove, CA owned by Yvonne Nguyen (local to Elk Grove) and her boyfriend Chris Tan. They teamed with head chef, Justin Yang to create a fabulous new dining option in Elk Grove. Their soft opening was back in October. When I had driven by on previous occasions, the line was out the door, so we opted for an early dinner this past Saturday to beat the crowds. We arrived right before 5:00 p.m., they open at 4:00 p.m. for the dinner shift. 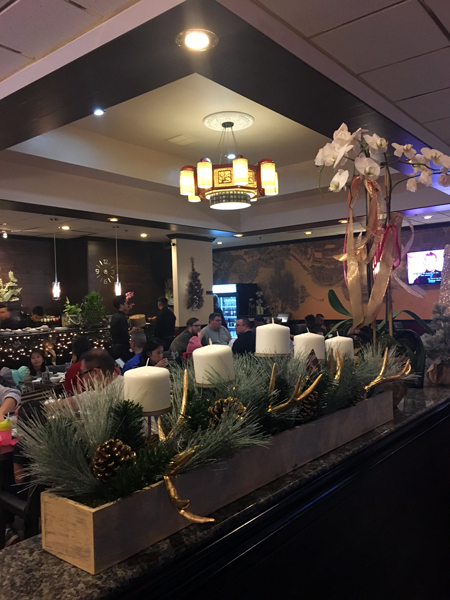 This worked out great and we were able to get a table quickly – the restaurant filled up very fast and the waiting area was full by the time we left. I loved that the decor was fairly understated, I enjoyed the overall vibe of the place. 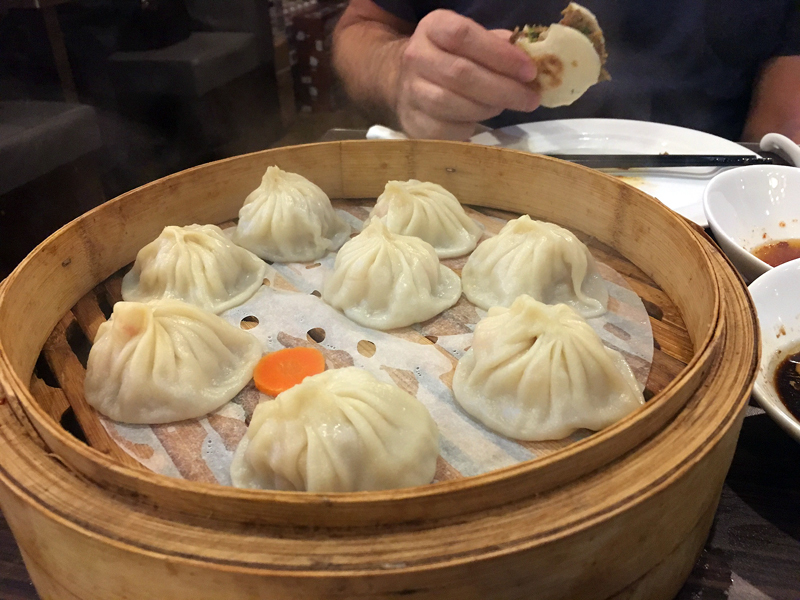 I was super excited to try the soup dumplings, their signature dish. 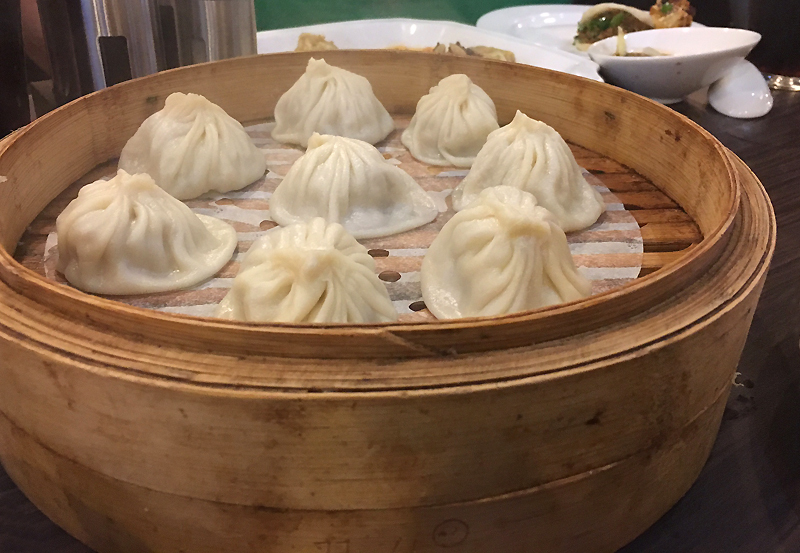 Xiao Long Bao (XLB) is a thin-skinned dough wrap (similar to a wonton) filled with ground pork or whatever meat or veg ordered and filled with a delicious broth, making them fun to eat. 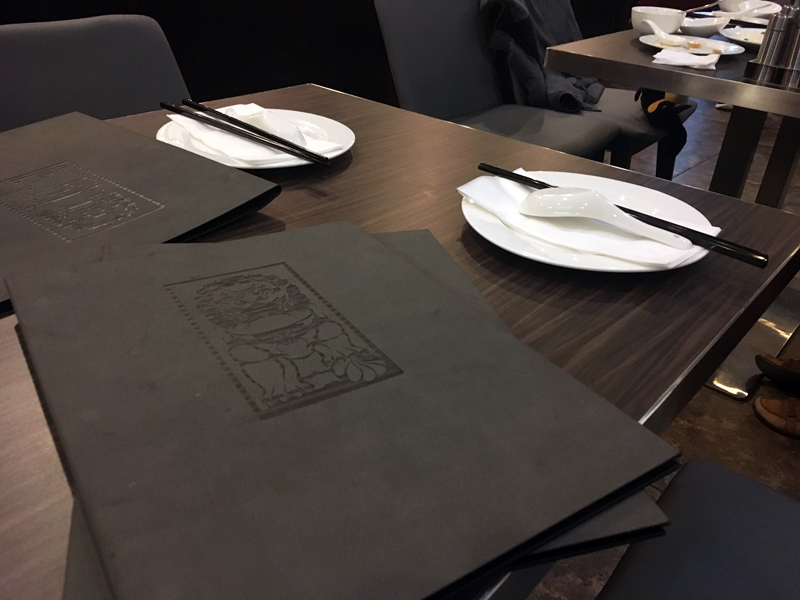 We used our chopsticks to gently lift the dumplings from the steamer basket, in some cases they wanted to stick, so we had to help them along with our human spoons, aka… fingers. You have to be careful to not puncture the dumpling, otherwise the soup will empty out. I plopped the first XLB into my mouth and bit into the skin to release the soup. Carolyn watched this all go down and then shared some Anthony Bourdain tips for us newbies. She placed the dumpling into her ceramic spoon, used her chopstick to make a small hole to let the steam out and to release some of the broth before eating. This method helped since my method led to a hot burst of soup filling my mouth – ha-ha! The lone carrot marked the difference between our two dishes. These were the “off the menu” special. Pork and Crab Dumplings (made with real snow crab). 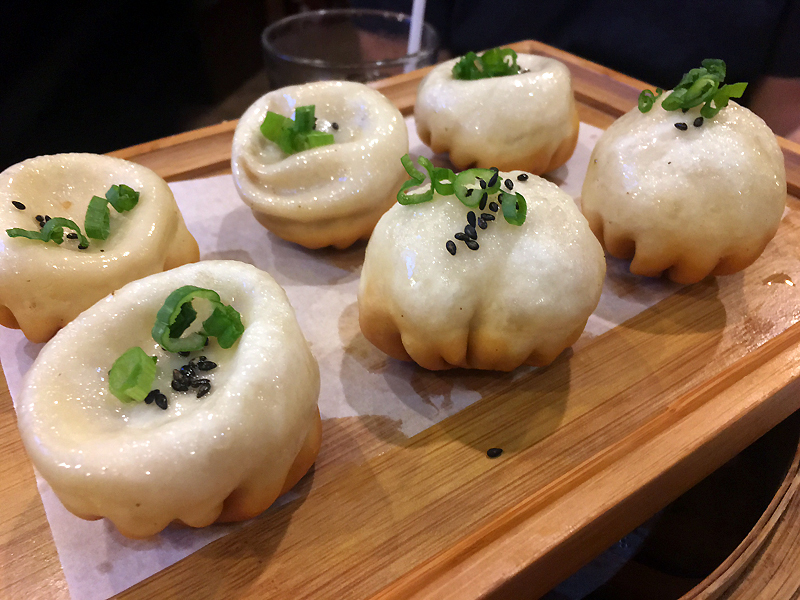 They recently added their very first vegetarian dumpling – stuffed with tofu, mushroom, egg and cilantro – I’m going to try that one next time. Speaking of next time, Carolyn and I planned our next visit and items to order before we were even finished with dinner. I’d say that is a good sign. To use the ginger, vinegar and soy sauce for dipping – you can add it to your spoon before placing the dumpling onto it. Genius! I’m not going to lie, I did pop several more straight into my mouth for the single bite soup release instead of being all Anthony Bourdain. The guys also went with the full mouth bite as well and nobody died or suffered from severe mouth burns. 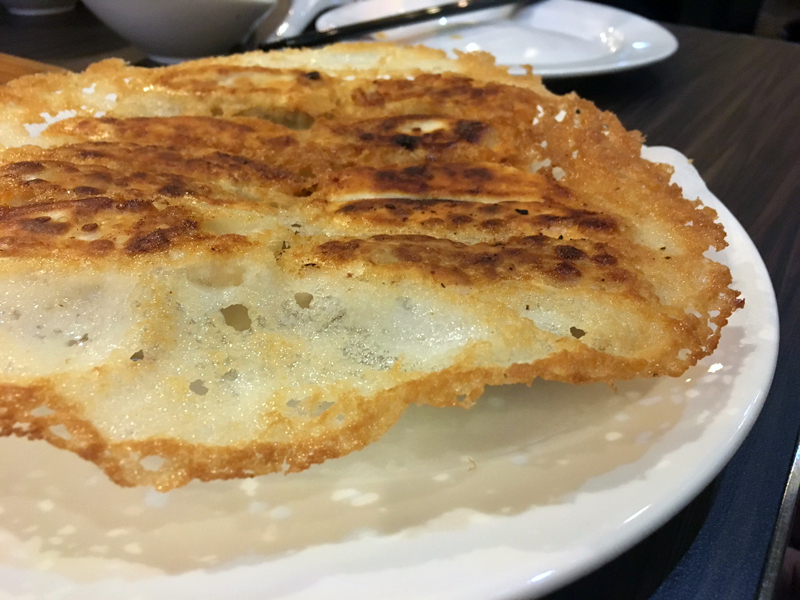 On the recommendation of our waiter, we also ordered the Pan Fried Pork Bun – pan fried, soup filled buns with pork and corn. It was a nice change in texture, but Dan and I both agreed that the thicker dough made it harder to eat. 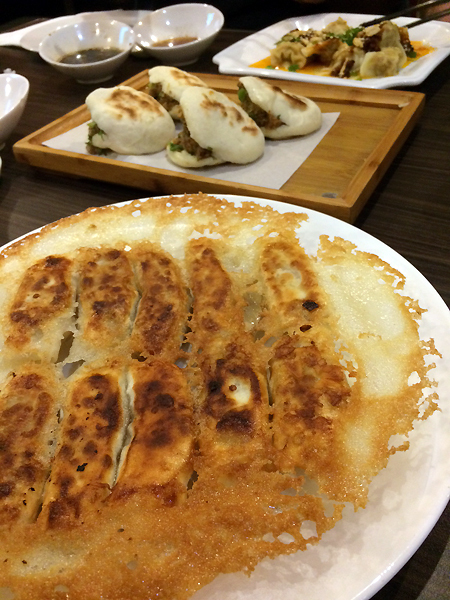 We both preferred the steamed dumplings, but these were also pretty damn amazing. 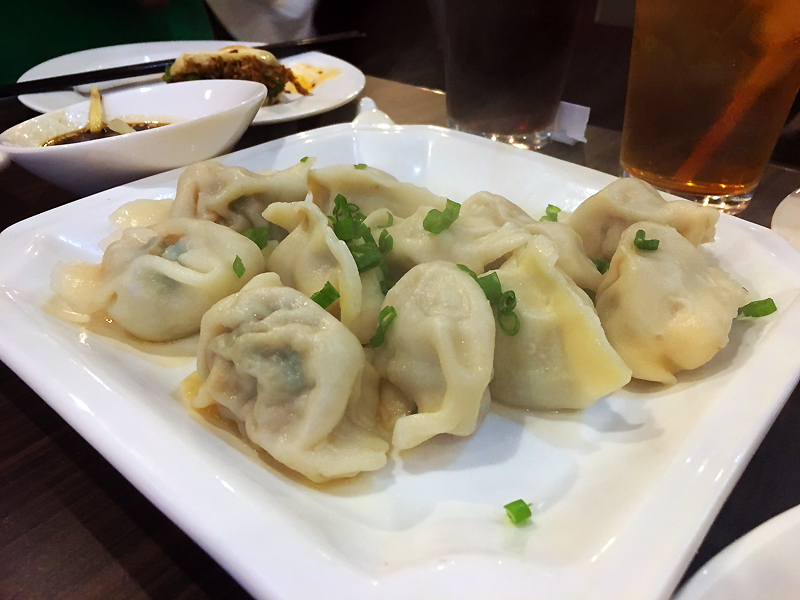 The simpler Pork and Chive Dumplings were also a very solid choice, especially when teamed with the dipping sauce. I preferred the soup dumplings, but would order these again. Besides all of the dumplings, we ordered a good sampling of other menu items and as I said above, made our mental wish lists for next time. 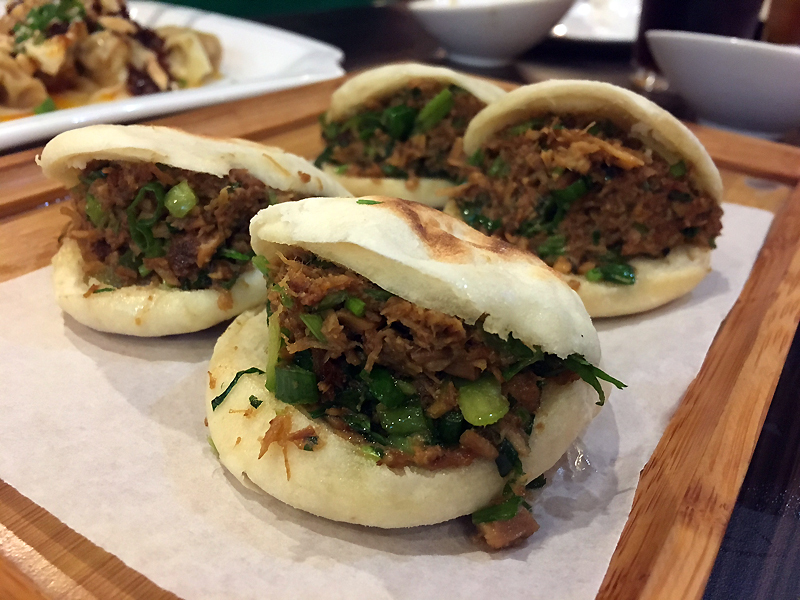 Roujiamo (Chinese Meat Burger) – Stewed pork ﬂavored with numerous spices stuﬀed between a lightly pan fried ﬂour bun. 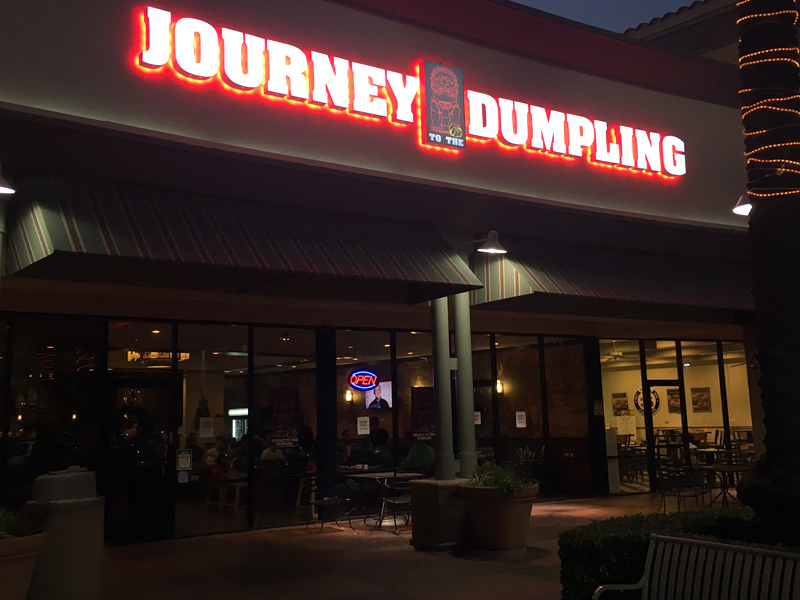 According to Journey to the Dumpling’s FB post, Roujiamo dates back to the Qin dynasty and has been called “the world’s first hamburger” – makes sense. I expected the Roujiamo to be more “team moist” but they were a little dry, so dipping it into the sauce helped. 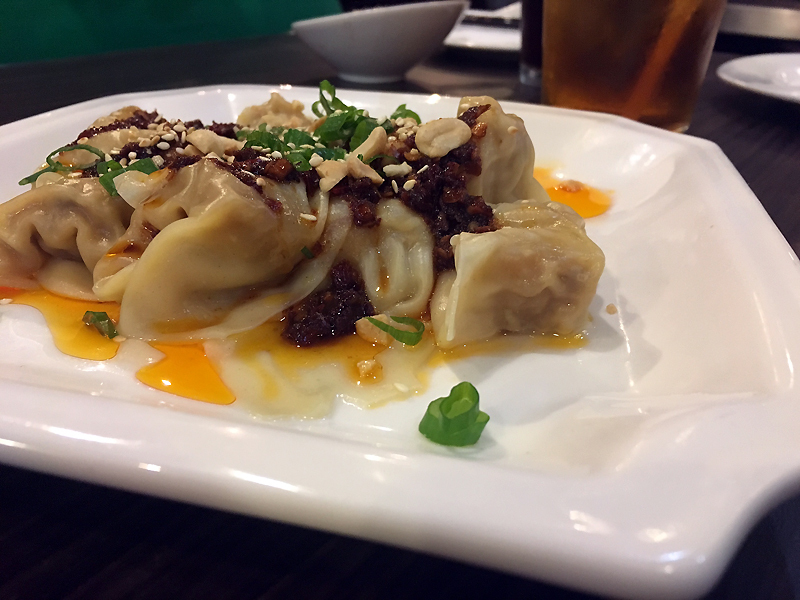 We also ordered the Wonton in Chili Oil. This was a close tie with the pork XLB as my favorite dish of the night. 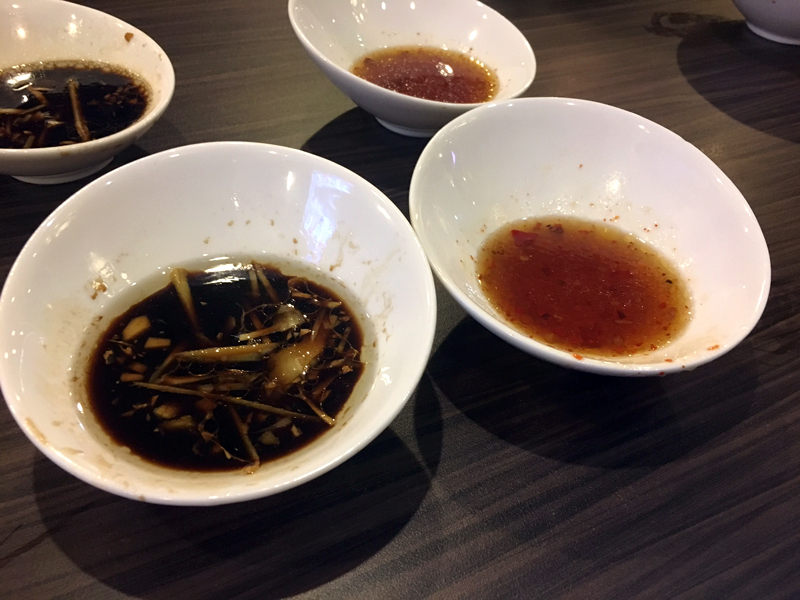 It was more like a chili paste combined with a chili oil – topped with green onion and peanuts. The perfect amount of heat, this made the repeat list for our next visit. The Pork & Cabbage Potstickers weren’t like any other potstickers I’ve ever had. They were formed together and surrounded by a crispy skirt. The flavor was good and it was a nice change from the more familiar potsticker. Carolyn was a fan of the crispy bits. 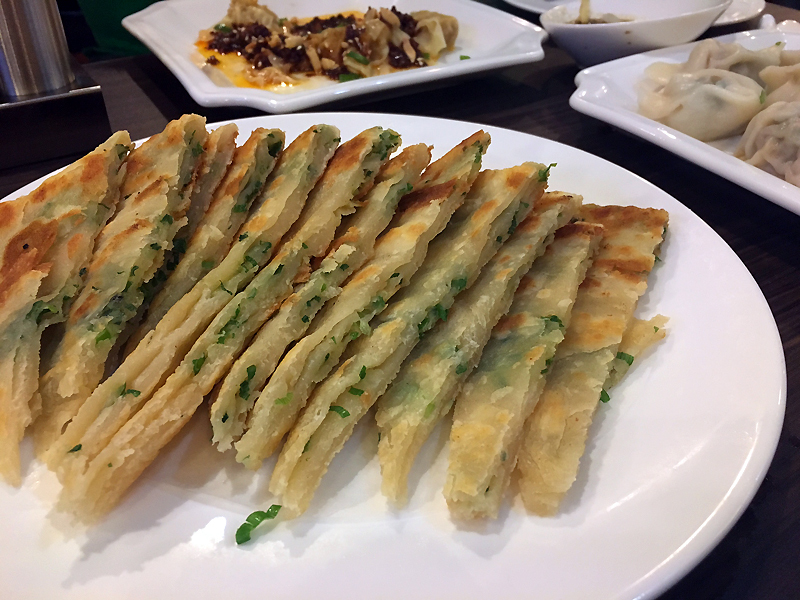 The Green Onion Pancakes were another “off the menu” item that recently came back after some changes were made to the recipe. These were the right amount of flaky and perfect when teamed with the dipping sauce. It should also be noted that two of us had not eaten anything during the day before this meal. What? We were excited to try everything, no judging allowed. And on that note, there is ALWAYS room for dessert. 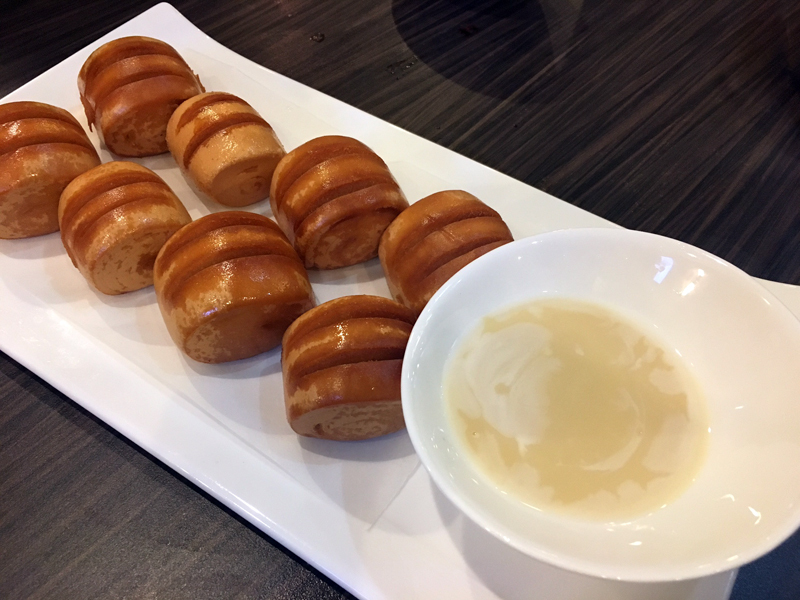 Carolyn wanted to try the Fried Mantou with condensed milk and I was happy to join in. I preferred to peel apart the layers and dip each piece into the condensed milk… because… duh, more sweetness to every bite. We had a great night out with friends and are happy to have a new place to add to our “go to” list. If you are local and haven’t tried it, you should. 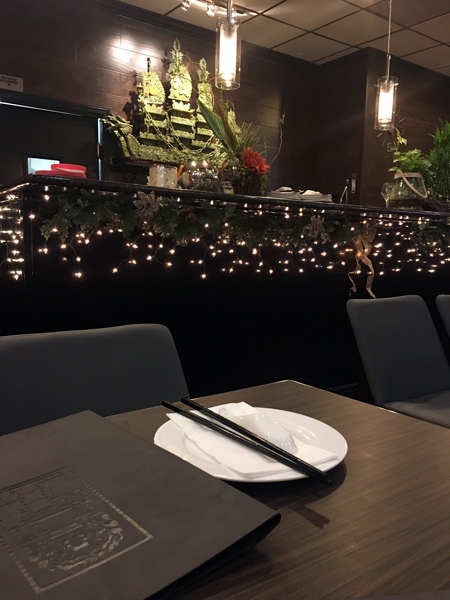 If you have tried it, what should I order next time that I didn’t mention in this post? If you aren’t local and have a fabulous soup dumpling place you like, please share below. 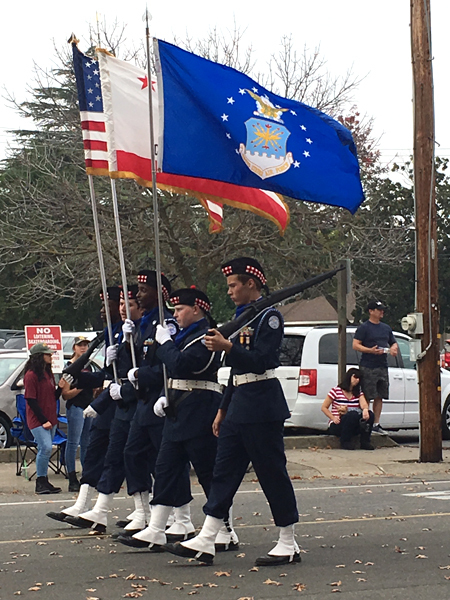 I always wake up on Veterans Day not sure how I’m going to feel. Long time friends and readers know that November 11 was also my late husband Ace’s birthday. Today we would have been celebrating his 48th birthday. 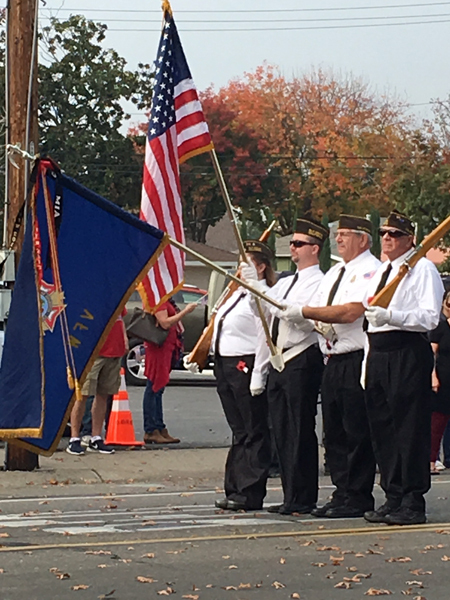 Six years ago I decided to celebrate life, by honoring the amazing veterans that served my country by attending my first local Veterans Day parade. 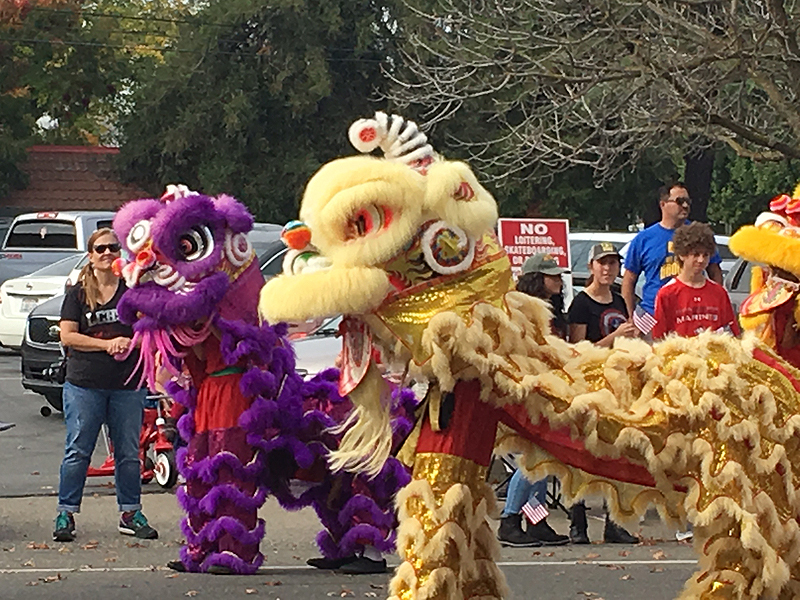 Today I’m acknowledging my sadness and grief, but I’m also choosing to celebrate freedom and the wonderful place I live – by once again attending the parade – which has grown so much over the past few years. 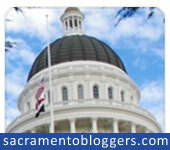 I’m not a person who posts political rants here on my blog or on Facebook. I don’t unfriend people for posting articles and opinions that don’t align with mine. I simply “hide” crap I don’t want to read… but here’s the thing, young students don’t know how to compartmentalize. Kids hear/absorb everything. You MAY think they are busy with their various activities and digital devices, but they are listening, reading and in some cases mimicking your every word. ALL of the name calling, hatred towards opposing political sides, finger pointing/blaming and the justifications. 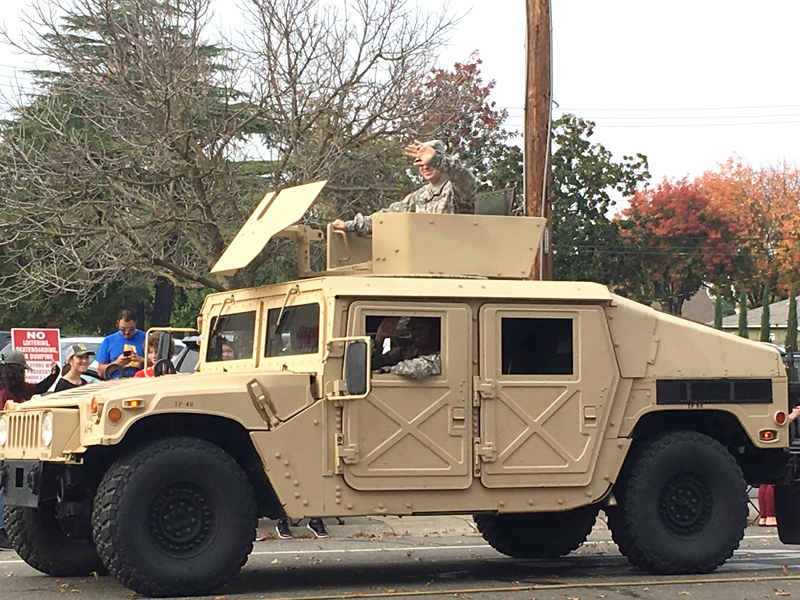 That stuff follows them onto buses, into classrooms, onto playgrounds and sports fields. I’ve listened to teachers this week, and looked at horrible images and words on Instagram representing pure hate and racial divide among our students and it’s awful. This is happening all over America and that crushes me. No kid should be afraid to go to school, it’s unacceptable and we as adults need to be the change to right this wrong. 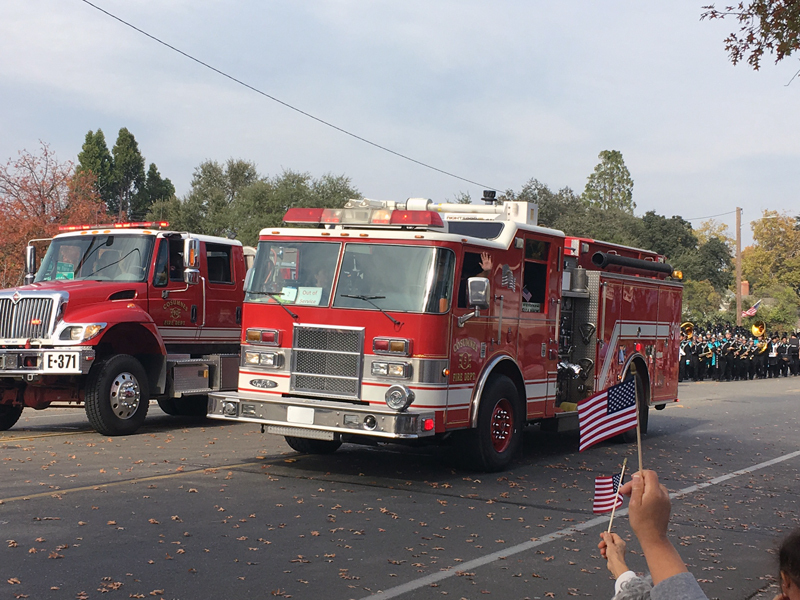 I felt such a sense of pride standing along the parade route seeing American flag after American flag and hearing over and over – thank you, thank you for your service and sacrifices made to every veteran attending or in the parade. 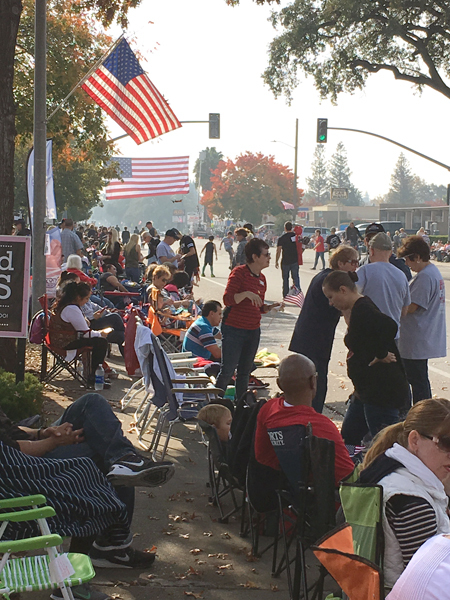 People were cheering, people were united and for the afternoon – it renewed my faith in humanity. 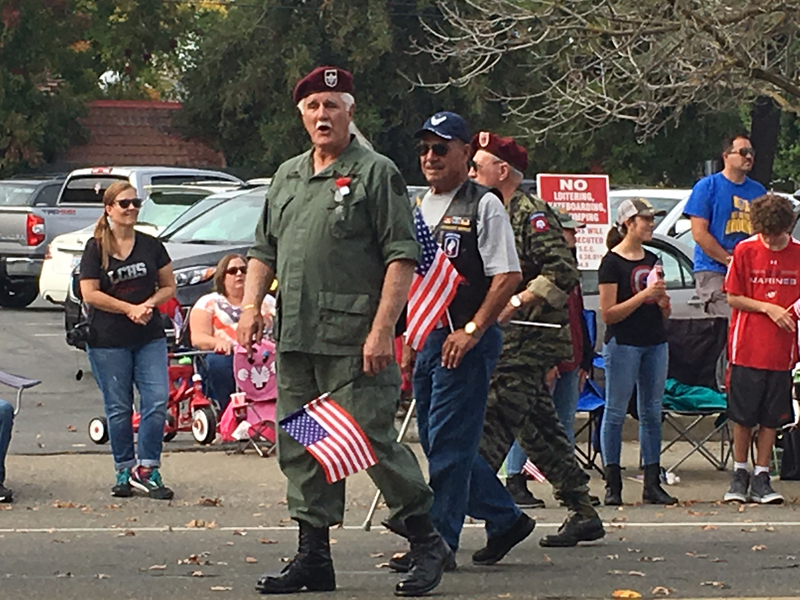 The above veteran served in Vietnam. His wife was standing by me and having trouble with her iPhone. The techie geek in me came to the rescue. She had her brightness turned down so low, her screen was black which was an easy fix. She gave me a huge hug. 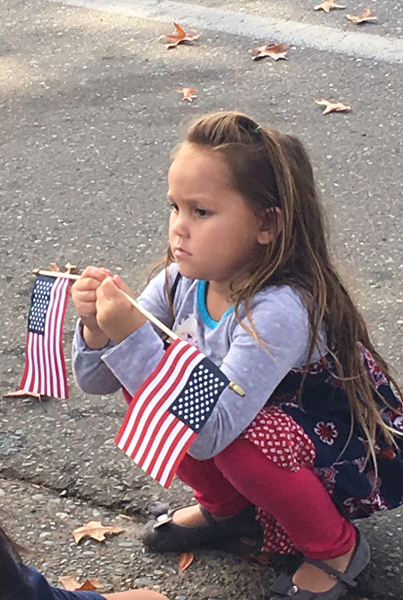 She was so proud of her husband – when he finally walked by, he saw her, waved and then ran over to give her a huge hug and kiss. I got a little choked up for sure. 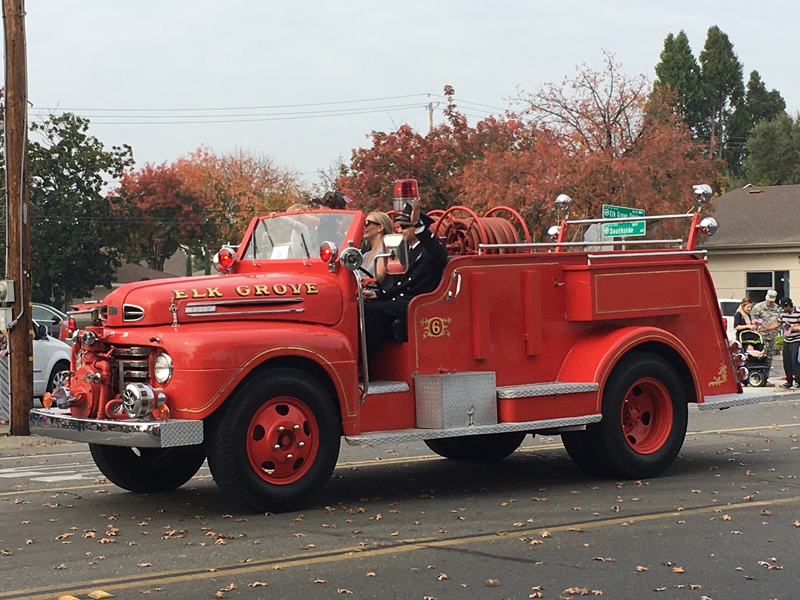 The above was a 1948 antique fire engine that once served the Elk Grove community. 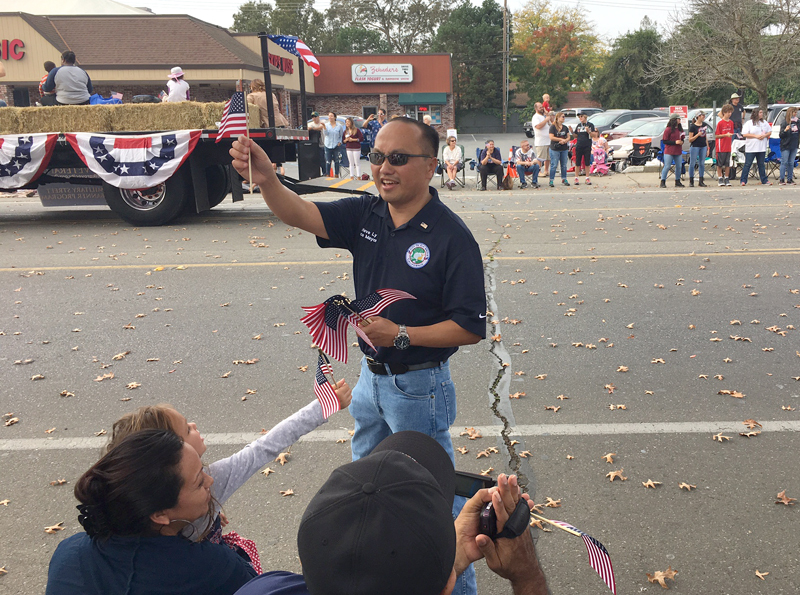 Elk Grove’s Vice Mayor and soon to be Mayor – Steve Ly – handing out flags to parade attendees. It was great to be able to say, “hi” to Steve in person. He has been a huge part of my Time of Remembrance Oral Histories project. 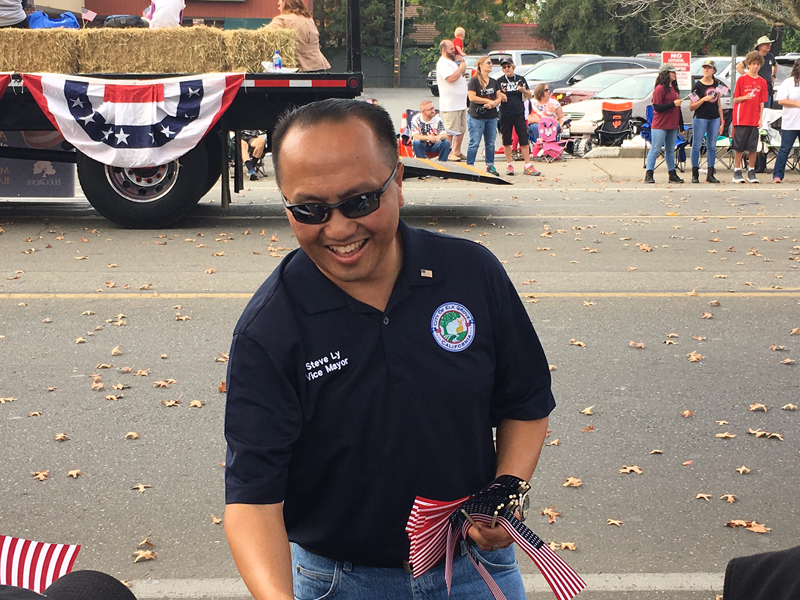 His father was an officer under General Vang Pao and a Robin (Backseater) to our American Raven pilots in Laos during the Secret War. 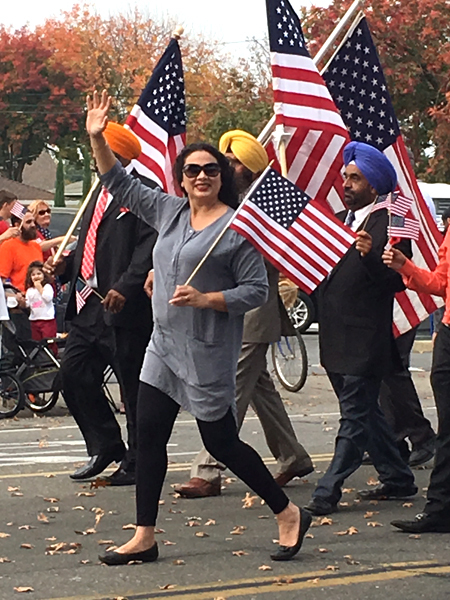 Our School Board President, Bobbie Singh-Allen, walking proudly with Sikh veterans. 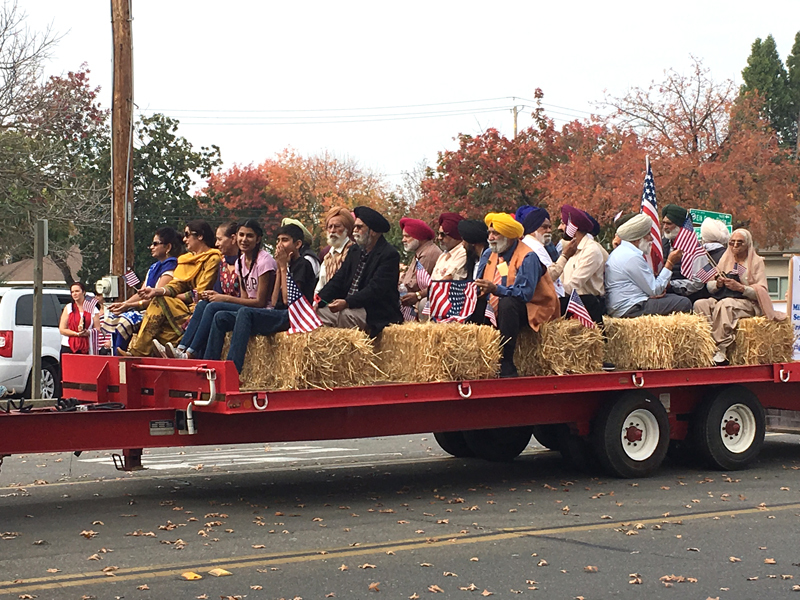 Sikhs have served in the U.S. military since WWI and the retired Army veteran/father standing next to me made a point to say this to his three children as they passed by us on the parade route. 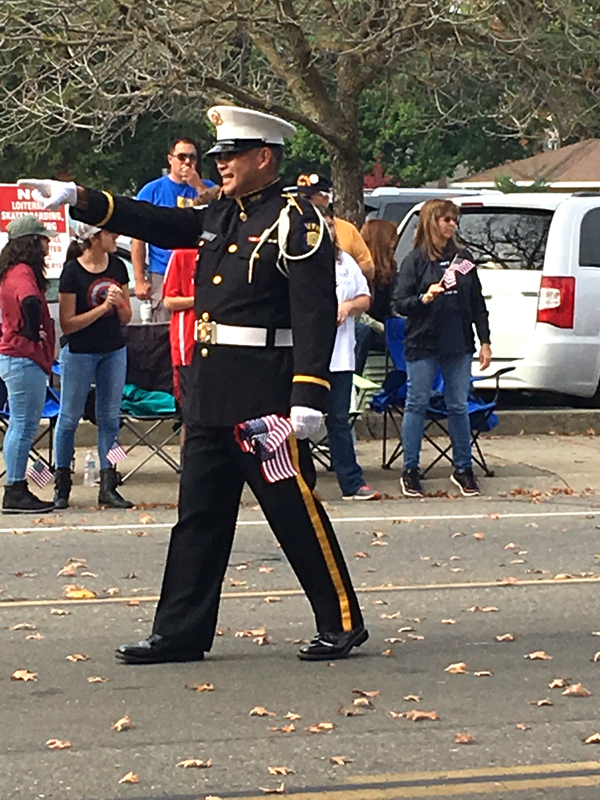 He said, “These men and their families are just as American as we are. 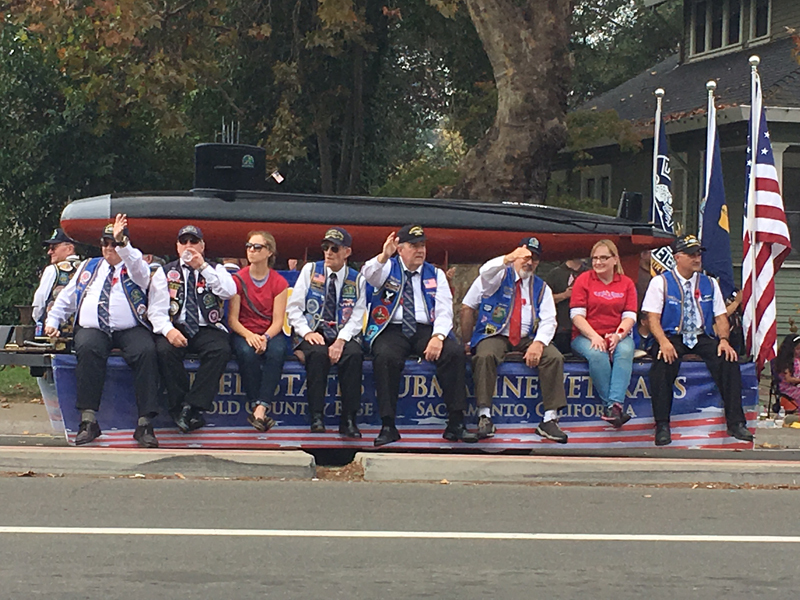 They fought shoulder to shoulder with us and deserve the same level of love and respect you give me and my other veteran friends, please remember that.” I pretty wanted to hug him. 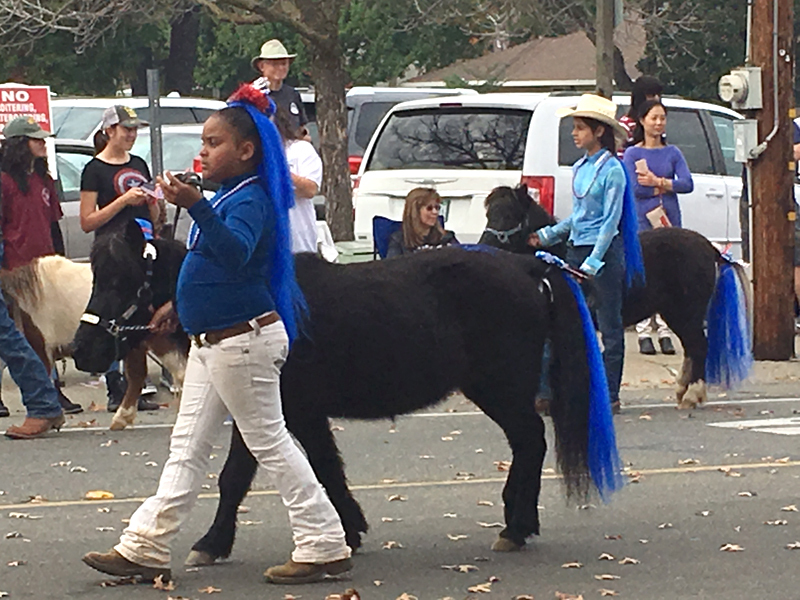 As the mini ponies passed – a parade watcher yelled “Hooray for the poop scooper, they couldn’t do it without you!” – everyone laughed and the poop scooper took a bow. 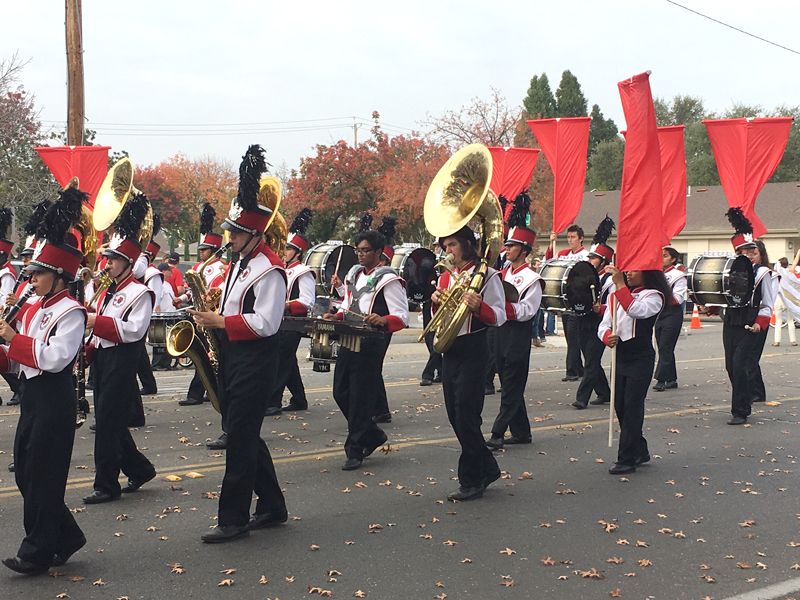 So many of our high school bands did such a great job playing and marching along the parade route. 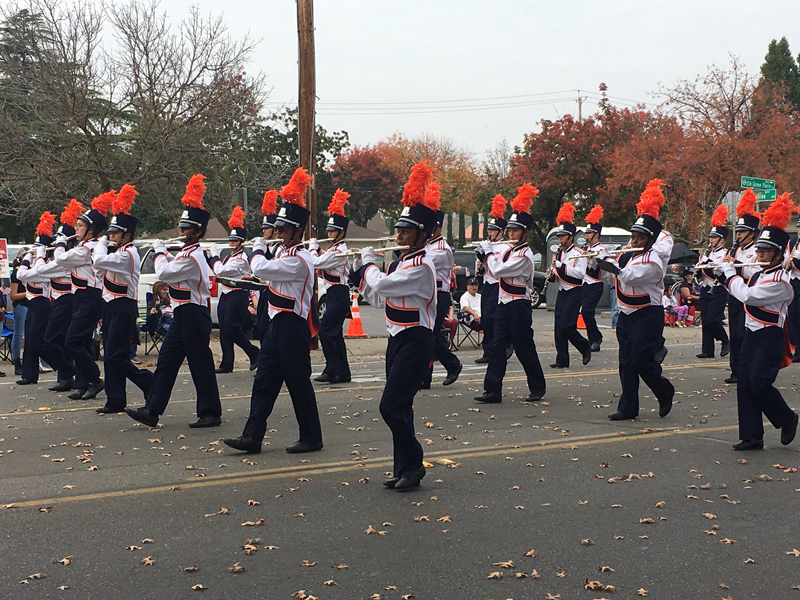 I’m glad I chose to attend the parade today. It’s just what I needed. I will continue to do my work with my co-worker Gail in the area of teaching cultural competence, cyberbullying, LGBTQ community support and our Time of Remembrance Oral Histories project… it’s my way of making sense of all of this and contributing to my own community and beyond. There is so much work to do in other areas too. Jump in, volunteer, talk to your family, friends and neighbors. LISTEN to them, their fears, their ideas. Step outside your comfort zone and start “doing” whatever you can to make you community, your city, your state, your country, a place you are proud of. Now since this is a food blog. 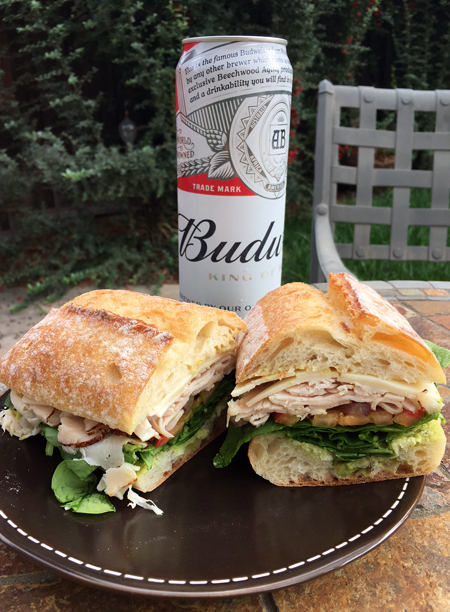 I stopped at a deli on my way home and grabbed a turkey, avocado, jack cheese, spinach and tomato sandwich and Ace’s favorite – a Bud. 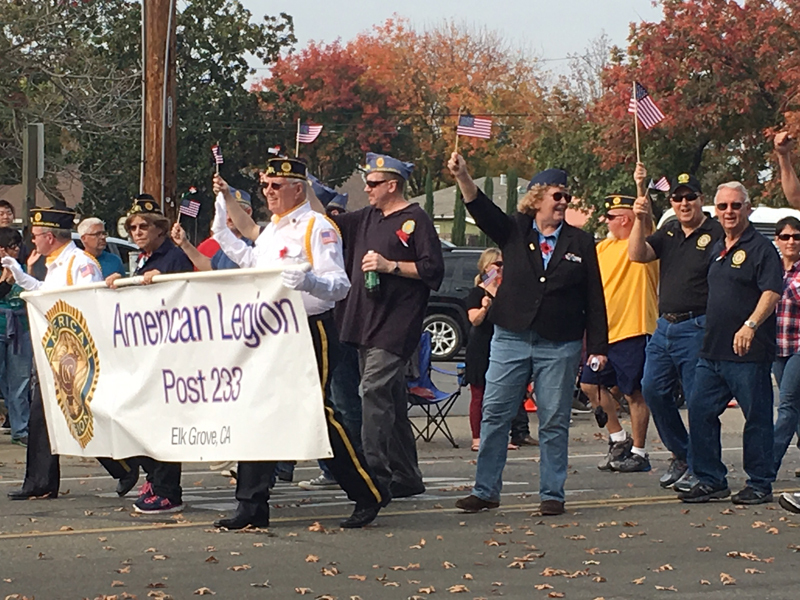 There is nothing wrong with day drinking on Veterans Day. There will also be cake tonight. 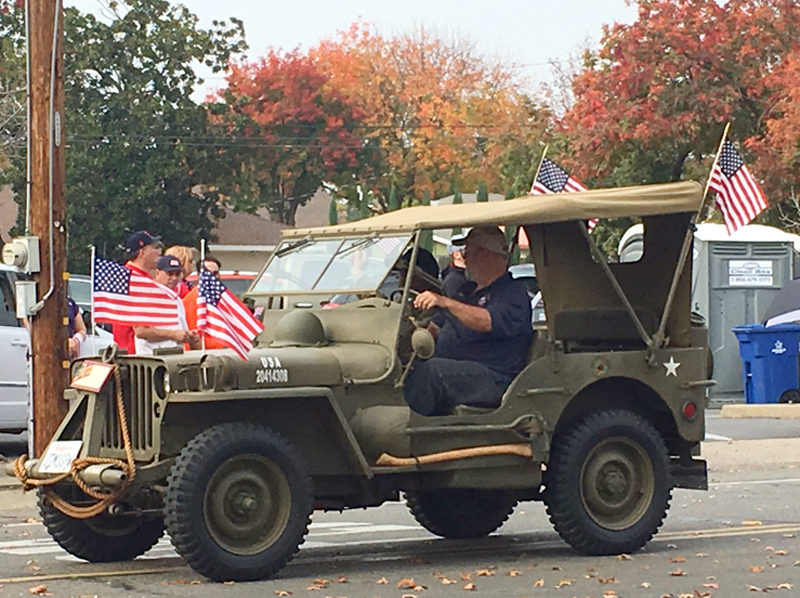 Happy Birthday wishes to heaven and a huge thank you to all veterans for their service and sacrifices.